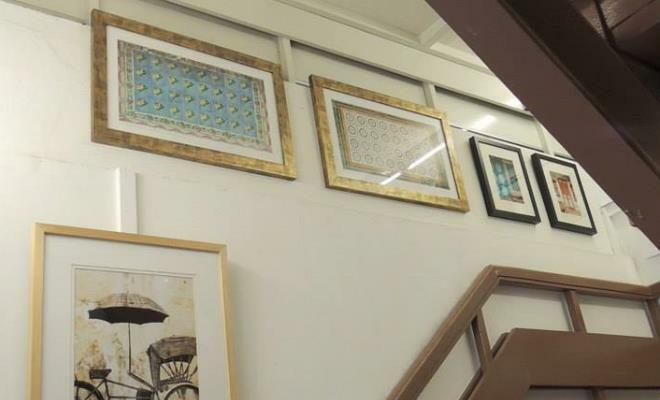 Owned by artist Rebecca Duckett-Wilkinson, 29 The Gallery features paintings, books, cards, gifts and vintage items in various colours and textures. 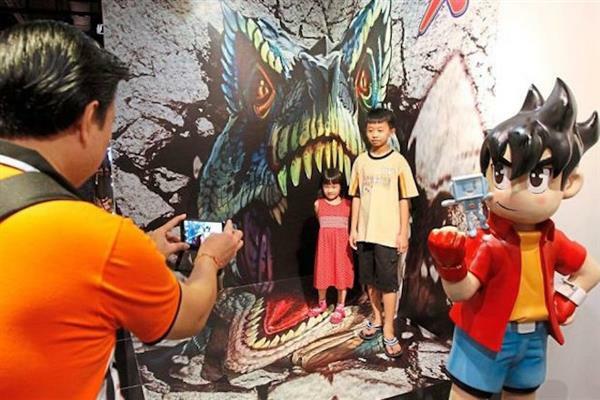 5D Interactive World is Asia’s first and ever multi-sensory experience which engages all five senses. It offers visitors more than a 3-dimensional experience. Combining art, creativity and education in five district, the experience is sure to create new paradigms and to fire up and captivate visitors. These 5-Dimension will be on play at 5-District using 5D-Methodology to wow and amaze visitors for a memorable visit. Each of the 5 District has one theme and that is to deliver a full 5D experience through the process of 5D-Methodology: define, design, develop, debug and deliver. 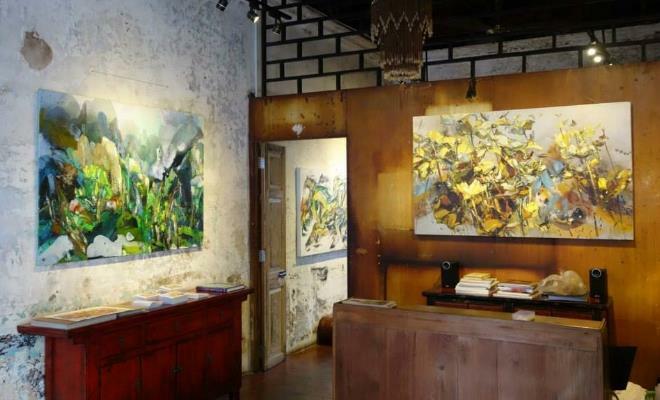 Conceptualised and opened by two artists Alfred and Jeff in 2007, a2 Art Gallery features the art works of local and international artists. 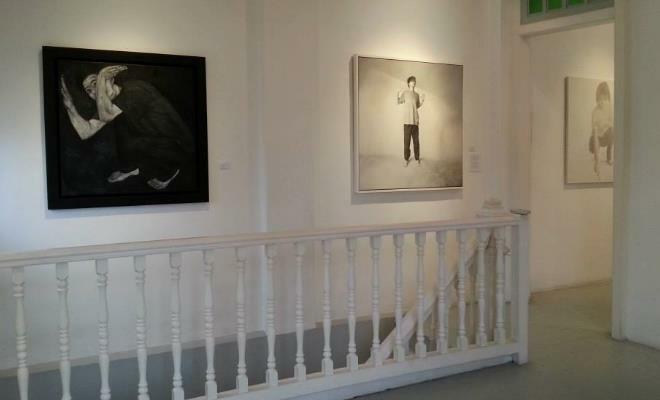 The gallery aims to encourage art lovers to see art as interpreted by artists from different cultural backgrounds as well as providing an art space for young and upcoming artists. 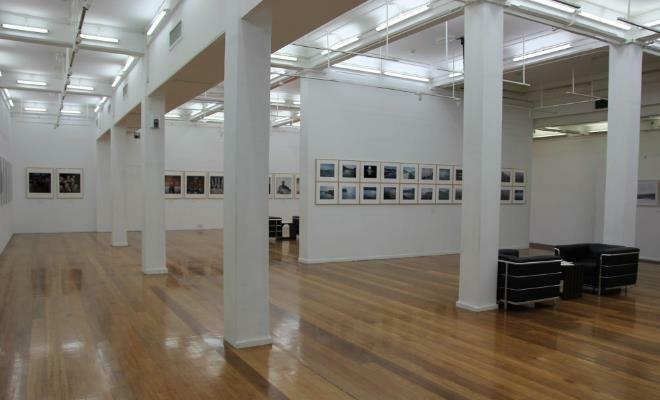 Most of the gallery's collection are of contemporary modern art pieces and workshops are held here regularly. ABN- Amro Bank Building is a heritage building at No. 9 Beach Street, George Town. It was designed in the Neo-Classical style building by the architectural firm of Wilson & Neubronner. 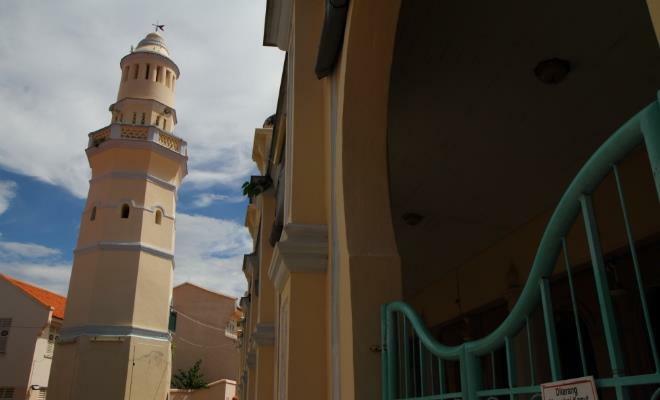 The Acheen Street Mosque or Masjid Lebuh Acheh is an old mosque located at the heritage enclave of George Town. It was also called the Mesjid Jamek as well as Masjid Melayu Lebuh Acheh. It is the oldest mosques in Penang. The founder was Tengku Sheriff Syed Hussain Al-Aidid. The street is named after Kapitan Chung Keng Kwee who gemerously donated his house to the Municipality for vehicle access ensuring that his name lives on for prosperity.s of Mercy Temple is a packed with devotees seekin divine guidance. 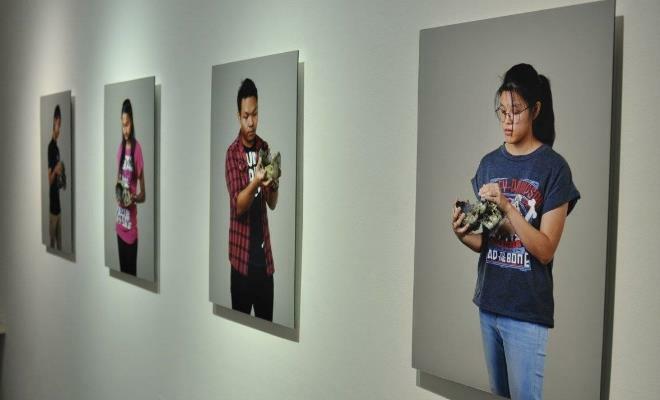 Alyssa Galeri showcases fine art, contemporary art, original prints, photography and sculptures created by Malaysian and Southeast Asian artists. 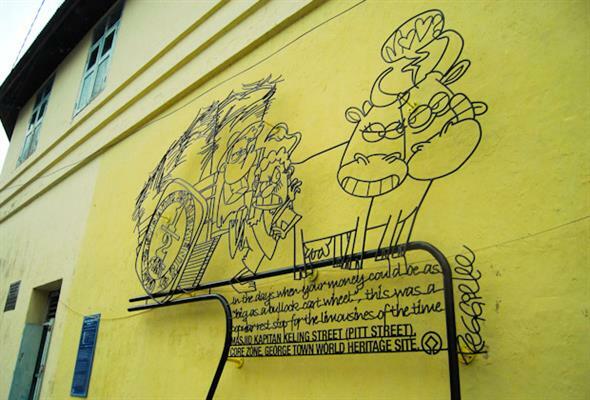 The Anak-Anak Kota Clubhouse is a shophouse on Cannon Street, the Heritage Enclave of George Town. 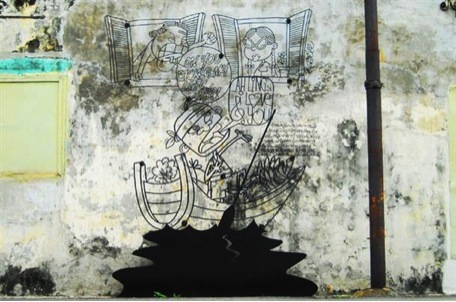 Anak-Anak Kota, or Children of the City, is a project by Arts-Ed (Arts in Heritage Education Program), a program spearheaded by Janet Pillai, a lecturer at Universiti Sains Malaysia. 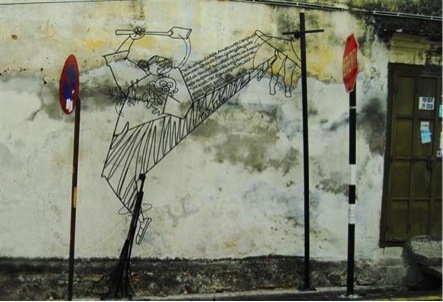 The purpose of the Anak-Anak Kota project is to expose young people living in the inner city of George Town, to the cultural and historical heritage . 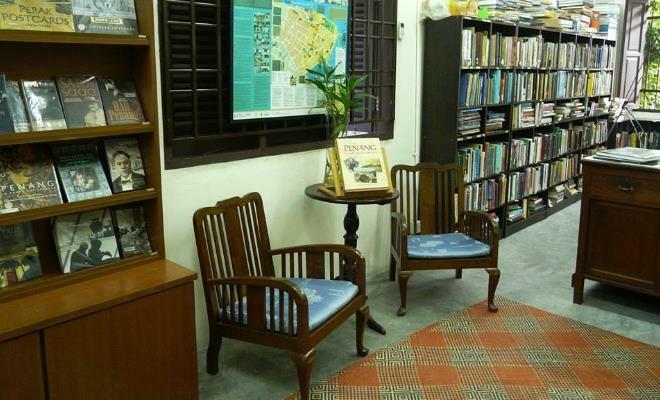 Areca Books is a rapidly growing niche publisher based in Penang. A number of its publications are pioneering works on trans-local history, cultural heritage and the environment. 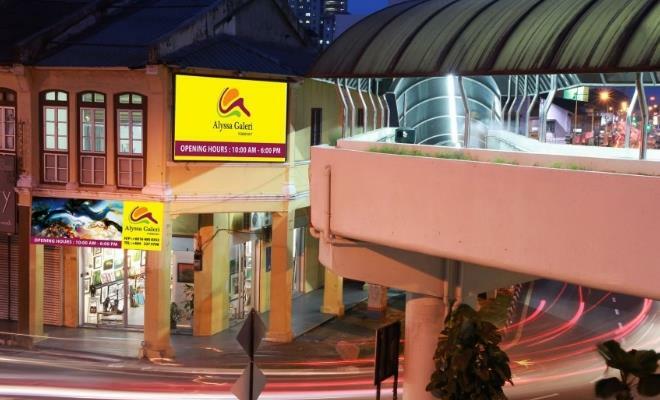 Currently there are two Areca Books outlets in George Town with the first branch located on Lebuh Acheh, George Town. Areca Books is a rapidly growing niche publisher based in Penang. A number of its publications are pioneering works on trans-local history, cultural heritage and the environment. This outlet currently runs as a publishing office. If you're seeking for local publications, head over to their latest outletlocated on Jalan Masjid Kapitan Keling. 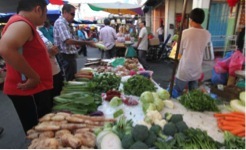 Campbell Street Market is one of the two community markets in inner George Town. A cannon shot fired during the 1867. Penang riots made a large hole in this area hence the name. Capal Jago is a well known leather sandals manufacturer since 1958 in Kepala Batas. They make sandals in the brand of JAGO. With 50 years of experiences, they make first genuine hand-made leather sandals. 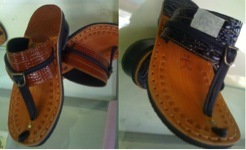 Capal Jago sandals are available in three colours; maroon, brown and white. Captain Francis Light Memorial is a monument on the grounds of the St George's Anglican Church at Farquhar Street, George Town .The Francis Light Memorial is built in similar Georgian-Palladium style as the church. It has a dome ornamented with vases. Underneath the dome is a marble plaque honouring Light. The Captain Francis Light Statue is a bronze statue, and it was sculpted by F.J. Wilcoxson and cast at Burton's Foundry in Thames Ditton. The statue was actually modelled after Francis Light's son, William Light. Since no picture could be found of the senior Light. 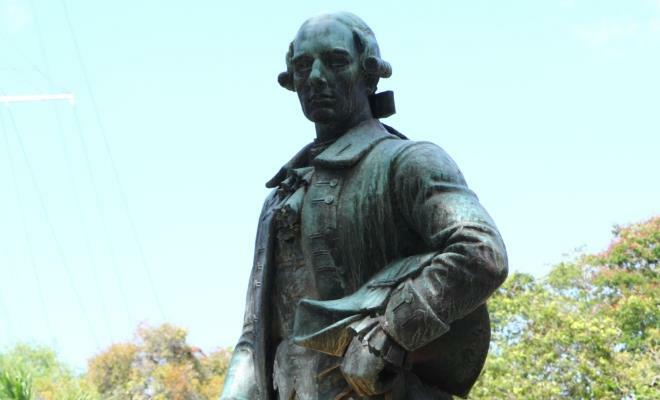 The statue can be found in the Fort Cornwallis. 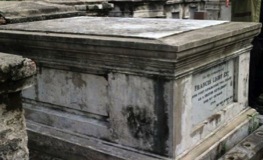 Captain Francis Light's Tomb is located at the Protestant Cemetery in Jalan Sultan Ahmad Shah. He is the founder of the British Settlement of Prince of Wales Island, as Penang was then named. Captain Francis Light's Well is the well dug for the founder of the British trading post of George Town. 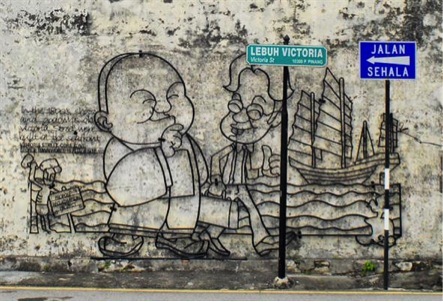 He built a road which ran from a newly-built pier to his home in Penang. The road was named Light Street while his home was located within the compound of the present-day Convent Light Street, a girls' school started by Catholic nuns of the Holy Infant Jesus order. The Carpenters' Guild at 70 Love Lane is one of the oldest trades association in Penang. It was established by carpenters and brick layers who were mostly Cantonese of the Sing Leng sub-dialect group and dedicated to the patron saint of the Cantonese tradesmen, Lo Pan, literally "North Duke", and was called Lo Pan Hang. 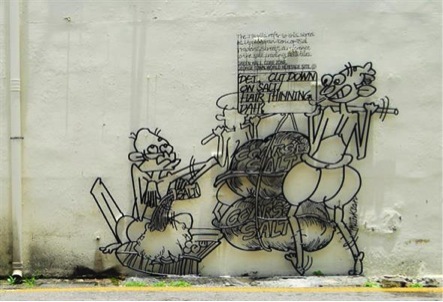 "Cats & Humans Happily Living Together" is a mural created by ASA, Artists for Stray Animals, in George Town, Penang. 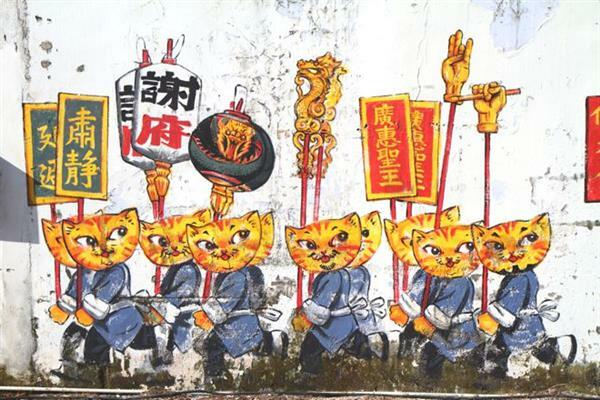 In this mural, people are replaced by cats carrying banners, lanterns and other religious items, and mini table bearing effigies of the deities following from behind. 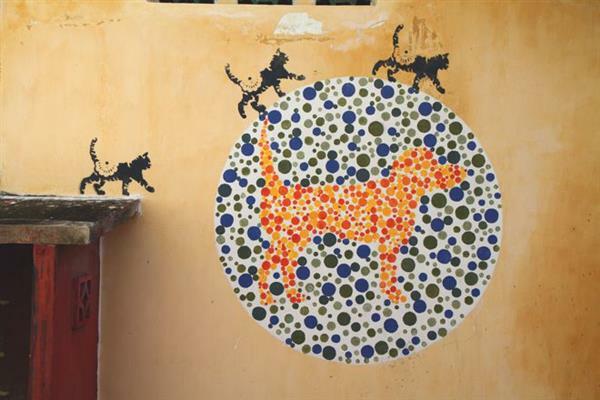 The cats walking for animal awareness mural is the 8th of 11 murals created for the 101 Lost Kittens project, to generate greater awareness of stray animals. The cenotaph was unveiled by the Prince of Wales on March 31, 1922, at the Esplanade seafront where some World War I battles were fought and where many sailors lost their lives. The Penang Veterans Association (PVA) erected another small monument beside the cenotaph to remember those killed in World War II, Siam-Burma Death Railway, Malayan Emergency, Indonesian Confrontation and the Reinsurgency period. 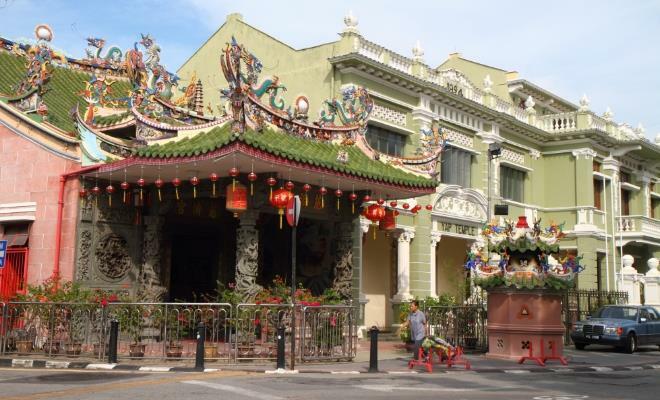 Cheah Kongsi, located at Armenian Street, Penang, is one of the oldest and most charming clan temples of George Town. The Cheah Kongsi ancestral temple of Sek Tong Seah @ Sek Tong Cheah Si Seh Tek Tong or Cheah Si Hock Haw Kong Kongsi is one of the less known but no less significant member of the Armenian Street Heritage Enclave. Where’s my husband? 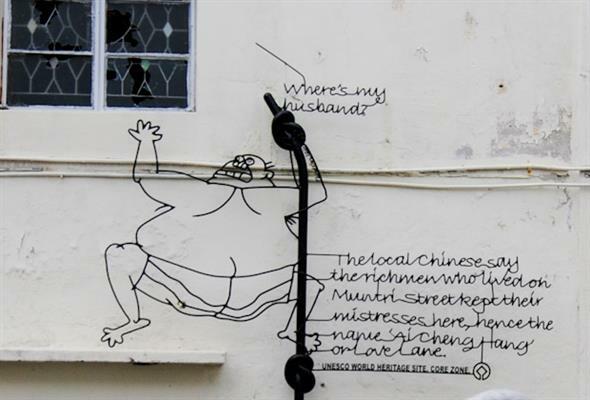 The local Chinese say the rich men who lived in Muntri Street kept their mistresses here, hence the name ‘Ai Cheng Hang’ or Love Lane. A Grand Mansion conceived and constructed by a Grand Man, an eminent edifice which history calls home; a peerless representation of the Paradigm Chinese Courtyard House – the Cheong Fatt Tze 'Blue' Mansion has been perfectly poised for over a century on firm foundations of architectural, cultural and historic superlatives. Chew Jetty is said to be the more known and prominent one among the eight clan jetties of Pengkalan Weld. 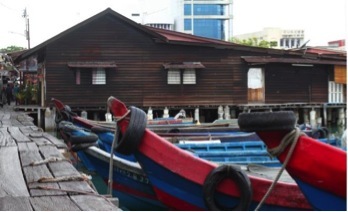 You can trace its origin back to the earlier Chinese settlements in Penang who built these village on stilts. 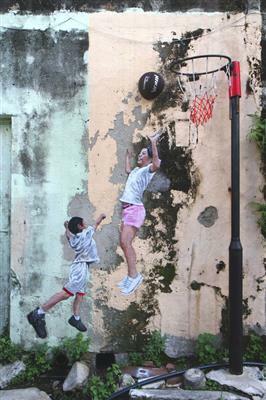 The Children Playing Basketball wall mural is painted by local artist Louis Gan. 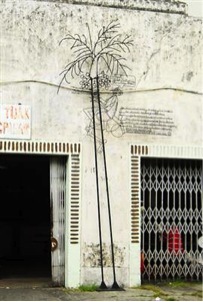 A Chin surname clan association of Toishan district, Guangdong, China. Building constructed in 1914. The association was established in 1876. 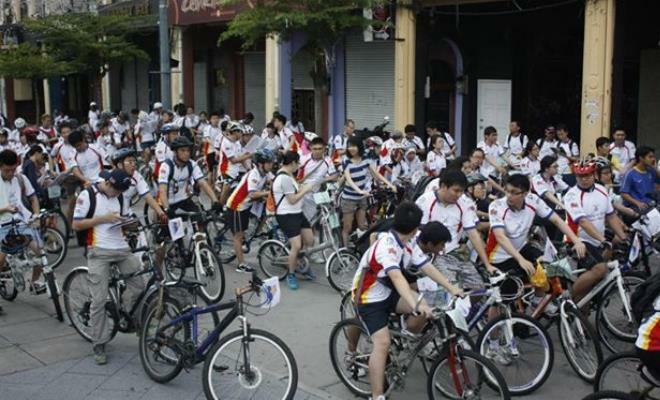 Chin Seng Leong Bicycle Shop is located on Lebuh Armenian, George Town. 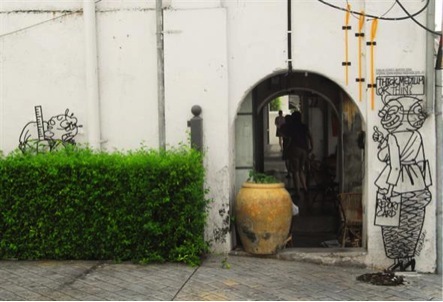 Apart from their delicious cake offerings and live jazz performances, China House has an art gallery upstairs called Art Space I & II that house paintings, photographs and more. 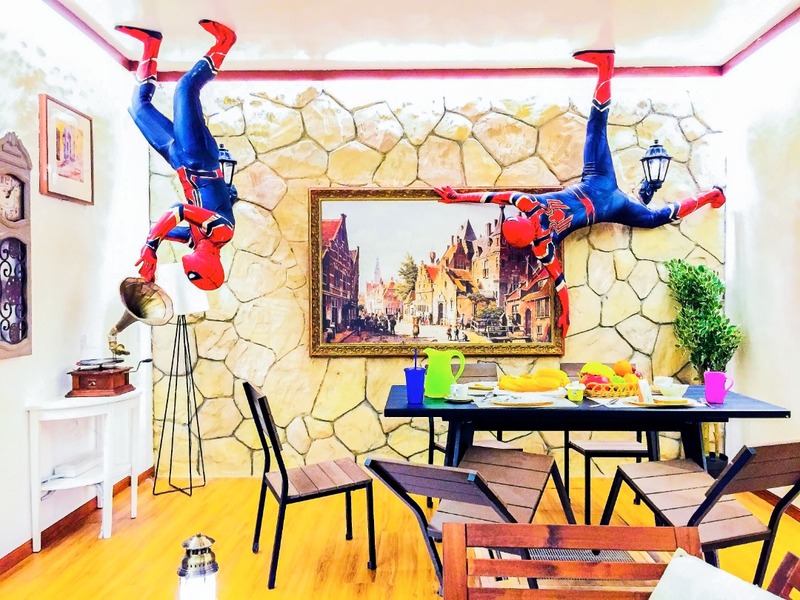 Address: Apart from their delicious cake offerings and live jazz performances, China House has an art gallery upstairs called Art Space I & II that house paintings, photographs and more. The Penang Chinese Chamber of Commerce is a local organization of businesses and companies in Georgetown. Members of the Chamber of Commerce are usually international and local operating companies, such as lawyers, property developers, tourism companies, airlines, manufacturing companies, import and export businesses, banks, finance companies, legal advisors, IT and electronics manufacturers. 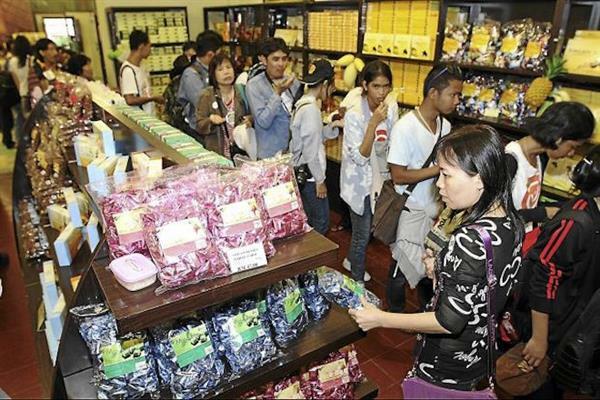 Chocolate and Coffee Museum specializes in retailing branded and high-end chocolate products. The boutique occupies a double storey bungalow that was formerly the New China Hotel. As would be expected, the inside of the Chocolate & Coffee Museum is a bonanza of chocolates, grouped by theme. If you are a chocolate lover, this place can help you put on some weight and lighten some pockets. The Immaculate Conception Church is a Roman Catholic church along Burmah Road in Pulau Tikus, George Town. 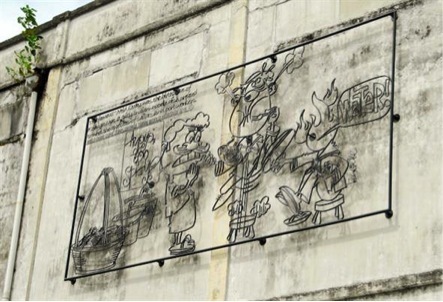 It was founded by Portuguese Eurasians who came to settle in Penang to escape persecution in Phuket. 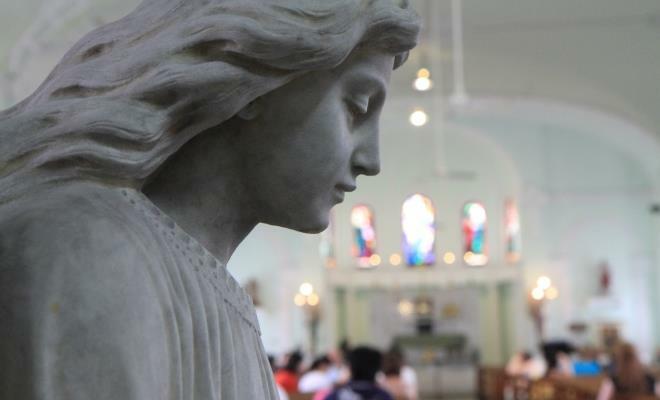 They were the "latecomers" of an earlier batch of Catholic Eurasian immigrants who arrived in Penang when the island was first established by Captain Francis Light, who had founded the Church of the Assumption in town. 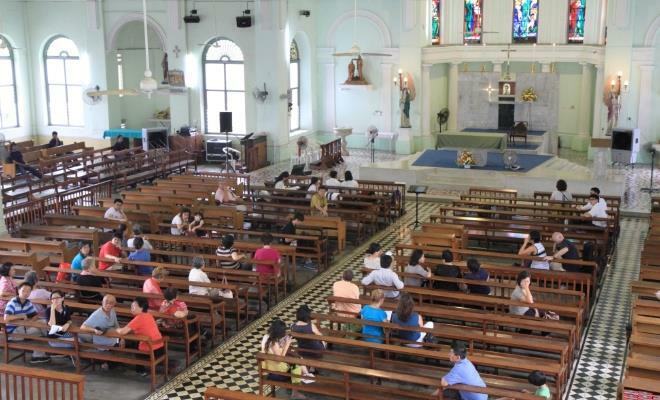 The Church of the Assumption was founded in 1786, when Captain Francis Light first came to Penang. 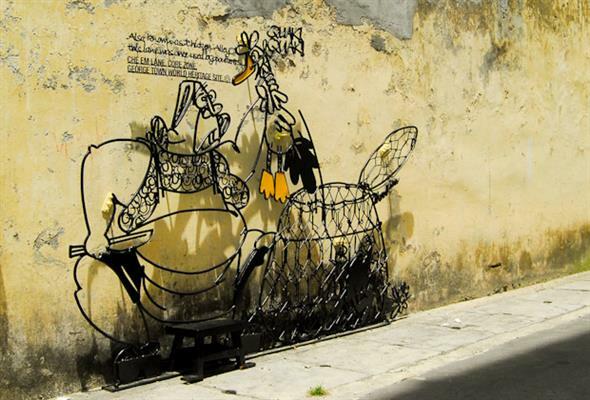 It is located in Farquhar Street, George Town, within the heritage core zone of the city. The structure began as an attap house in 1854. 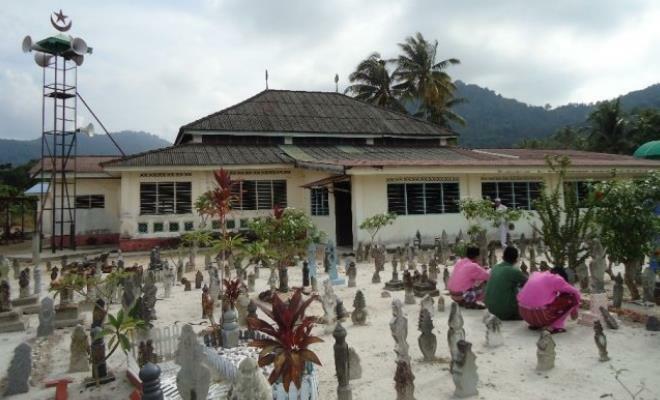 By 1897 Balik Pulau had approximately 250-300 Catholic converts. The City Hall of George Town or Dewan Bandaraya George Town is a Victorian-style building along Jalan Padang Kota Lama. It was constructed in 1903, and opened in 1906. It holds the distinction as being one of the first buildings in George Town, Penang, to be completely fitted with electric lights and fans. A place that will bring you back to Penang's colonial past and the lifestyle the wealthy merchants of Penang through unique antiques such that reflect a decadent way of living and reflect the vastness of space in which they used to live. To add to this, there's also a personal handwritten document by Captain Francis Light, founder of Penang and intricate art pieces from the past such as a sublime marble carving of a young girl asleep on a pillow and beautifully commissioned stained glass. Most of the exhibits once lived in large, well-known mansion around Penang. The Convent Light Street School is the oldest girl's school in Penang, founded in the mid 19th century by Holy Infant Jesus Missions. It was a chapel, an orphanage, a boarding school for the elite including royal princesses of the Thai family and today, it functions solely as a Malaysian public school for girls. Not only there were hapless cows bred and slaughtered here but you could also smell the fish hung out to dry. Wisma Kastam is one of the heritage buildings along the Weld Quay waterfront of George Town. It was built at the turn of the 20th century. Before Wisma Kastam was built, the shoreline was somewhere between Beach Street and what is today Victoria Street, depending on the tide. Dataran Pemuda Merdeka, Seberang Perai or originally known as British Recreation Club (BRC) is close to the locals' heart. The place recorded various historical and nostalgic events. Here is where struggle for the independence started in Seberang Perai. Former Prime Minister Tun Abdullah's father, late Dato Haji Ahmad Badawi among those who fought for the independence here. Dato Koyah Shrine, or Keramat Dato Koyah, is a shrine to a Muslim saint along Transfer Road in George Town. 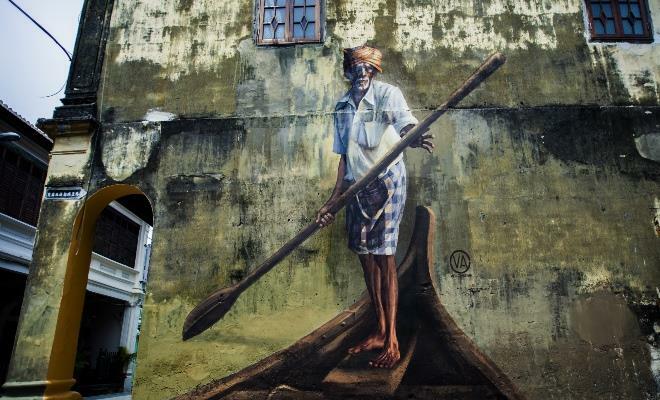 He arrived in Penang from the Malabar coast in southern India (in present-day Karnataka and Kerala), where he was a mendicant, wandering from place to place, teaching, healing the sick, until one day, an incident happened that forced him to flee. Dato Koyah arrived in Penang some time in the early 19th century. The Dhammikarama Burmese Buddhist Temple in Burmah Lane, Pulau Tikus, George Town, is the only Burmese Buddhist temple to be built in Penang. Originally known as the Nandy Molah Burmese Temple, the Dhammikarama Temple was built in 1803. 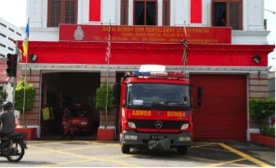 Up until 1909 the police doubled as George Town's firefighters. The Sun Yat-Sen Memorial Hall is located at Macalister Road, George Town. It is housed within the Penang Philomatic Union building. The Penang branch of the Philomatic Union was established through the efforts of Goh Say Eng, who also founded the Penang branch of Tung Meng Hooi. It was originally housed at the Li Teik Seah Building at 152 Carnarvon Street. The Sun Yat Sen Museum is a privately managed museum at 120 Armenian Street, in George Town. It occupies the shophouse where Dr Sun Yat Sen had his base while in Penang. From the outside, the Sun Yat Sen Museum may appear stark when compared to the ornate architecture of the clan temples down the street. Also known as "Chicken Alley". This lane was once used by poulterers. The Eastern & Oriental Hotel is a hotel with old colonial charm and the finest traditions of comfort and service. Right at its door step is an amazing heritage of art and architecture, festivals and food. The E&O is just a few minutes walk away from a variety of shops, restaurants, cafes, bars and clubs. Chong San Wooi Koon is a Cantonese district association located at the junction of Lebuh King (King Street) and Lebuh Gereja (Church Street) in George Town. It is the association of Cantonese clansmen from Heong San district in present-day Guangdong Province in southern China. The association is housed in a heritage building built in the 19th century. The building was already in its place during a 1870s document. This old Acehnese godown was originally a jail building already extant in 1805 - hence the thick walls and small windows. 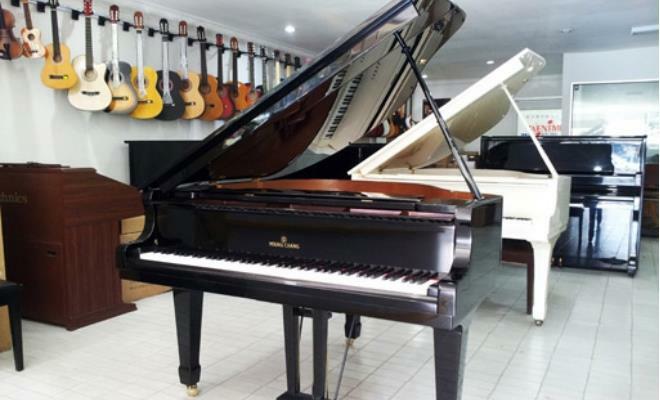 Located in Air Itam, Excel Music Studio provides quality music education to both children and adults. They offer traditional classical music courses to the more current pop and rock music courses. Excel Music also provides Christian music courses specially designed for aspiring church musicians. 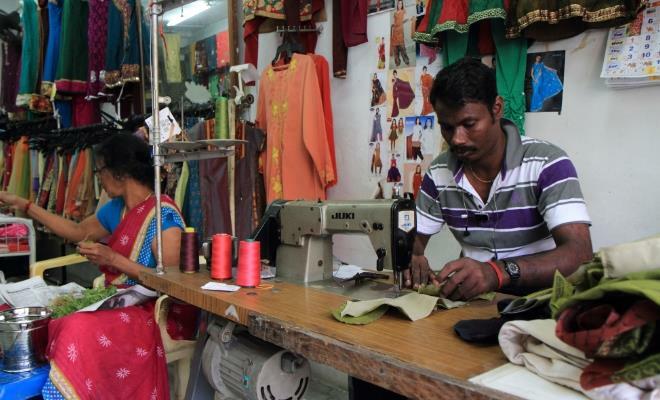 These shops stock a range of high quality textiles imported from Japan and Korea as well as imported sarongs from India and Indonesia, and locally-produced batik sarongs. Some retailers have diversified and also sell religious paraphernalia for Hajj pilgrims such as special luggage labels, bags, outfits and prayer mats. 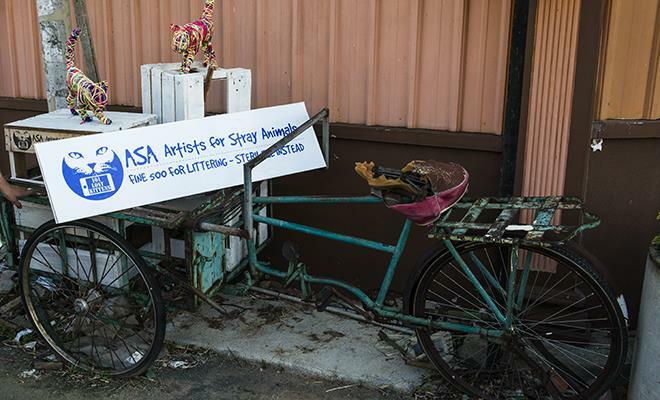 This art installation was created to discourage people from disposing of unwanted pets, but instead, sterilize their pet to prevent unwanted litters. 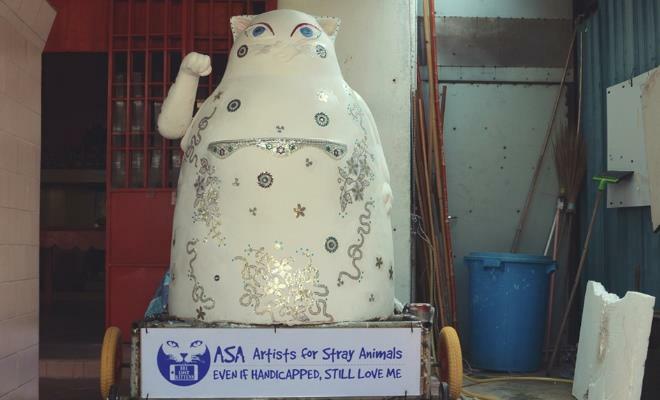 It was created by ASA (Artists for Stray Animals) for the 101 Lost Kittens project. The floating mosque is built on the bay but is not actually floating. It is standing on pilings and stilts and also has a towering minaret which the height is equivalent to a seven storey-building. 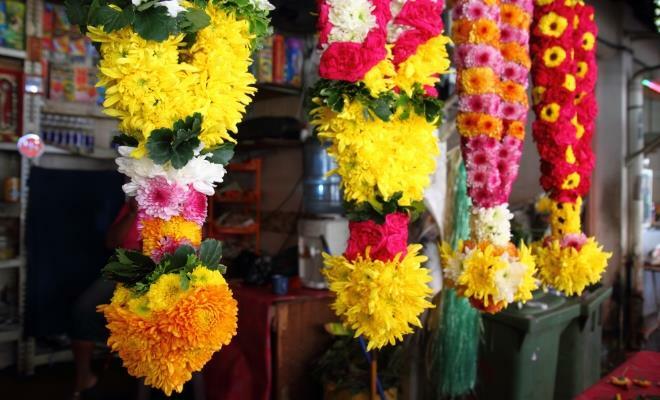 Traditional garland making is a skill that was brought to Penang by Indian immigrants as an intrinsic part of Hinduism, where garlands and fresh flowers are offered at temple shrines and households altars. Commonly used flowers include, jasmine, marigolds, dahlias and roses, chosen for their fragrance and colour and sourced from flower farms on Penang Hill and as far afield as the Cameron Highlands. Folklore by the Sea is where live theatrical shows take place daily. Thoughtfully curated live dramas as well as interesting storytelling shows are performed to take the audience back in time to the old days of the dwellers’ simple lives at the jetties where the sea was their main source of sustenance. 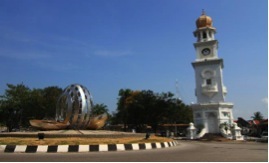 Fort Cornwallis is named after the Governor-General in Bengal in the late 1700s, Charles Cornwallis. It is one of the most interesting historical landmarks in Georgetown. It is located close to the Esplanade, next to the Queen Victoria Memorial Clock Tower. 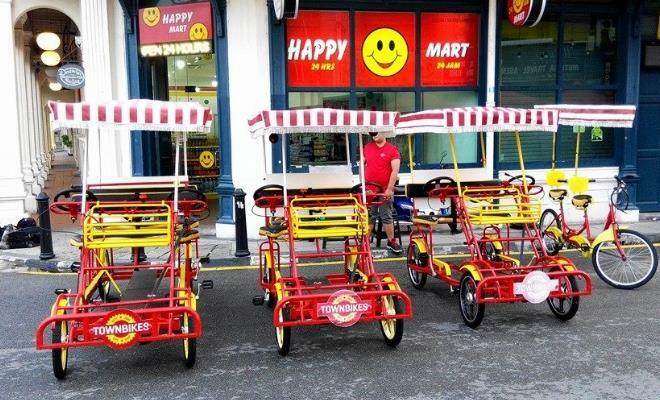 Freedom Leisure Cycle Supply provides bicycle rental services in Victoria Street, George Town. 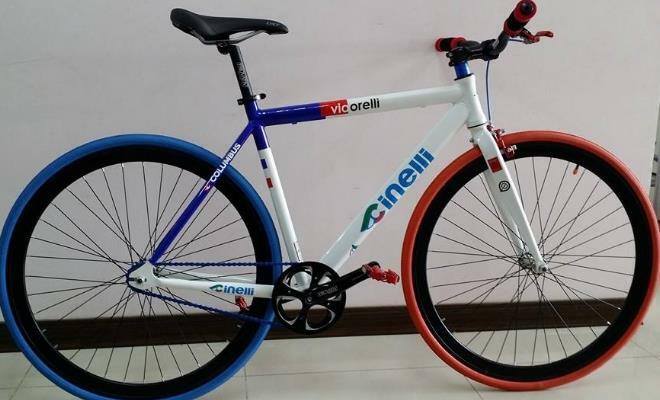 Part of its collection of bicycle rentals include Japan classic city bikes, folding bike, tandem bike, Japan postman bicycle, tricycle, children bike and family bicycle. 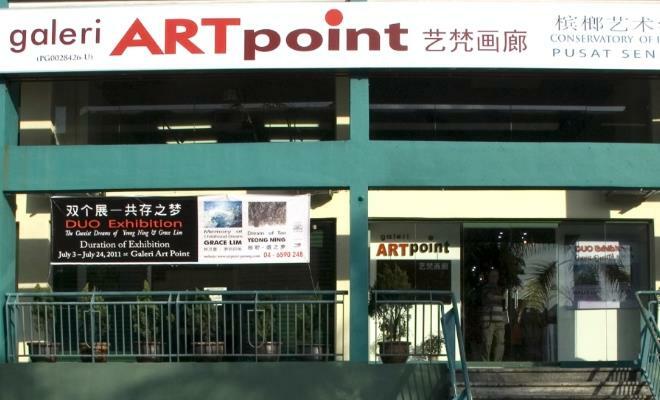 Located at Sunny Point Complex, Galeri Art Point showcases a wide selection of paintings by local and international artists; art prints and postcards; art books and art catalogues; framing for artworks and art prints and more. 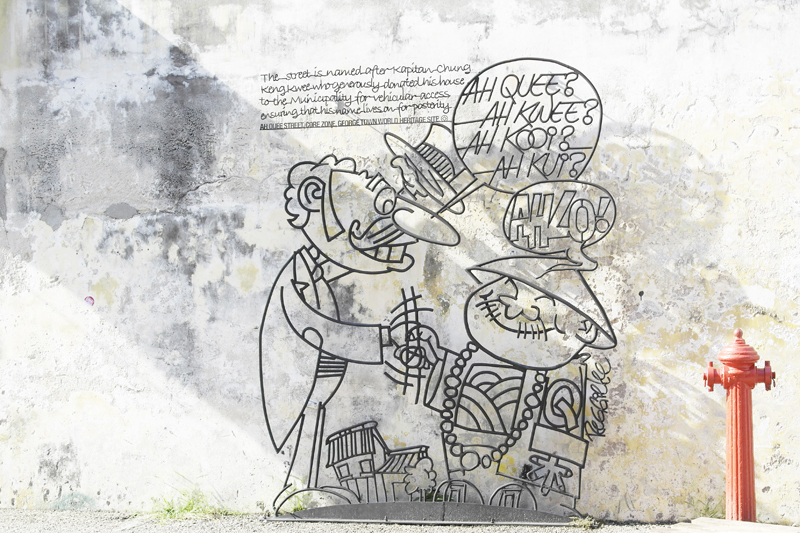 Sibling to the Galerie Huit Arles, the art gallery showcases both local and international artists in a laidback, casual setting. The site where the art gallery is located was once a domain of wealthy Chinese spice merchants. A visit to the art gallery is by appointment only. 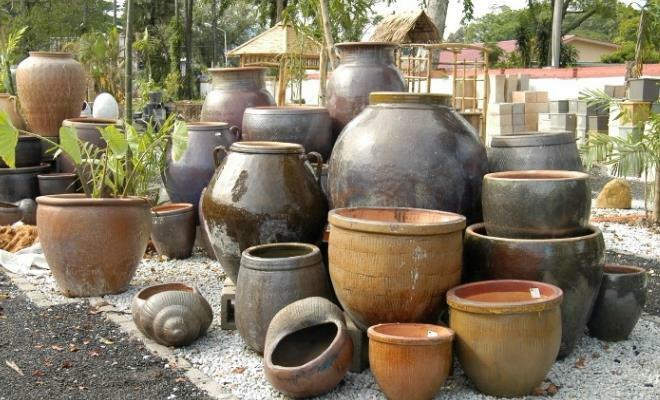 If you have a lawn or a garden that needs some sprucing up, head over to Garden Ku for locally made and imported plants and ceramic vases. They also offer pottery classes led by experience Japanese ceramists. While its royal English name sound very grand, it's also locally known as "Gedung Rumput" or Grass Godonm with bullock carts being parked along this wide street. George Town Dispensary is housed in a landmark three-storey corner building at the junction of Beach Street and China Street. The side facing the junction has a classical pediment to mark the main entrance. On the Beach Street side is a five-foot way with the dispensary behind it. On this side of the building is the signage George Town Dispensary. The building was a clinic in 1930s, later a barbershop, and other uses. Restored in 2003 and now home to GTWHI, Penang's State Agency for Heritage. 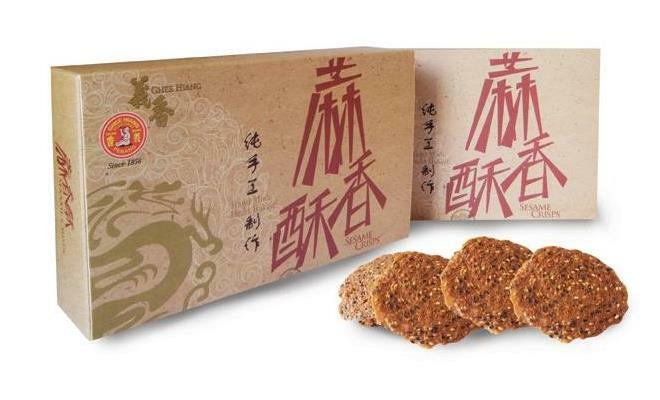 Ghee Hiang produces more than 10,000 pieces of its round green bean biscuits depending on the season. It is also one of the oldest bakeries around. Penang Ghost Museum features the horror and myth of all evils and ghosts, especially of legend stories in Malaysia. Penang Glass Museum produces art glass & make glass souvenirs including customisation of your own glass. 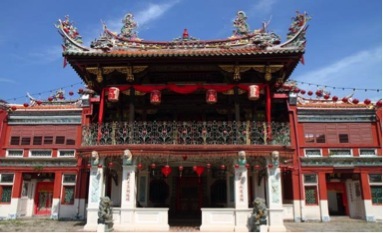 Built in 1728 through the joint efforts of the Chinese settlers (Hokkien & Cantonese Communities), the Goddess of Mercy temple is the oldest Chinese temple in Penang. 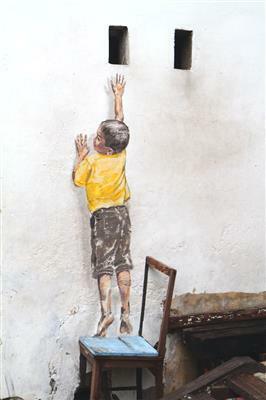 The museum celebrates traditional childhood toys and games that were played by people in Penang when they were small. 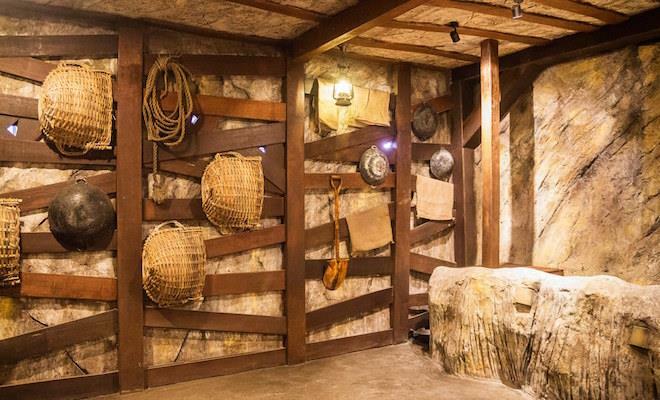 The museum provides an educational experience, and a glimpse into the past. 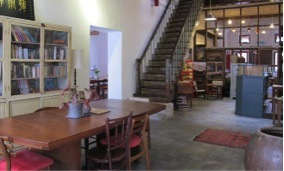 The museum is housed in a double-storey restored shophouse which was GohKaki Cafe. 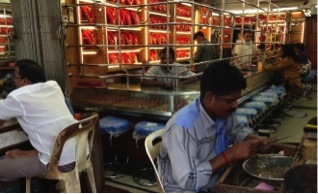 The traditional Indian goldsmith sat cross legged on a floor mat. Bent over a small bench to work their work demanded patience creativity and skill. 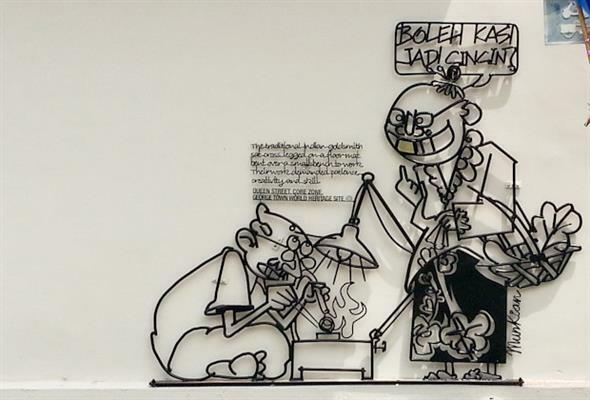 The Penang Goldsmith Association or Penang Ta Kam Hong is the biggest Chinese goldsmith. 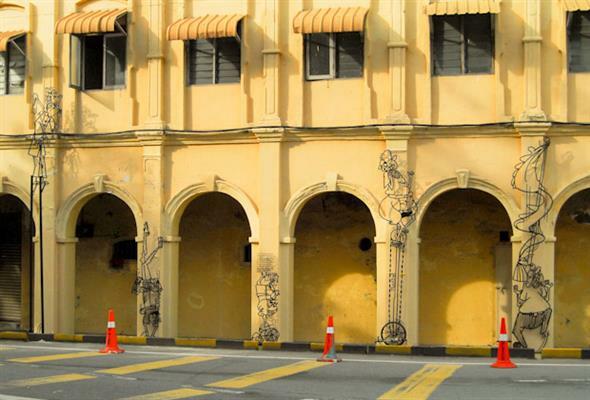 It is located along Muntri street and it is the oldest goldsmith in Penang. 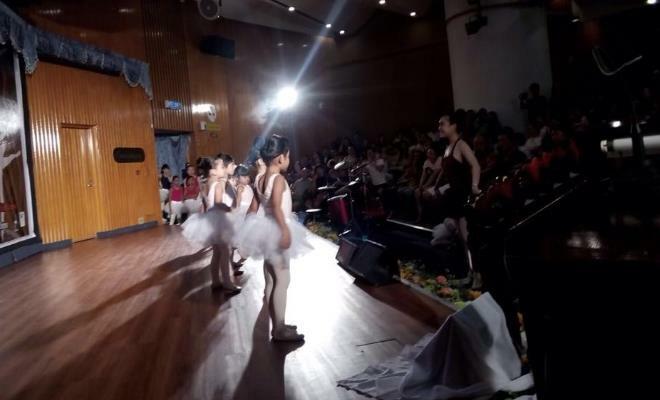 Greenapple Academy is a ballet dance academy located in Air Itam. Address: No. 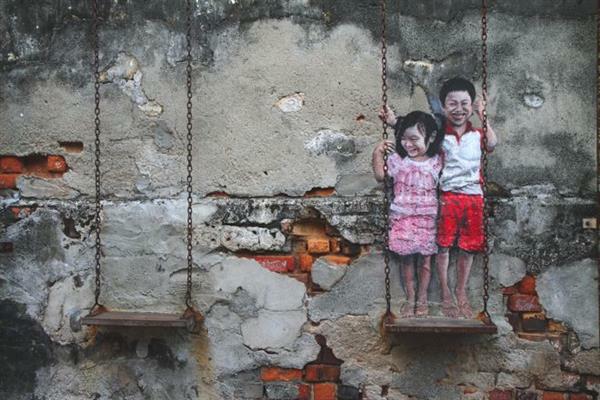 1 Solok Scotland, George Town, 10450, Penang, MALAYSIA. 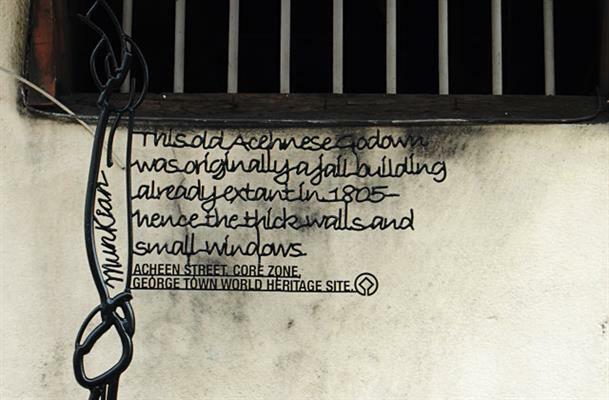 The centre aims to promote the value and significance of our local tangible heritage, more so in a UNESCO World Heritage Site like George Town. 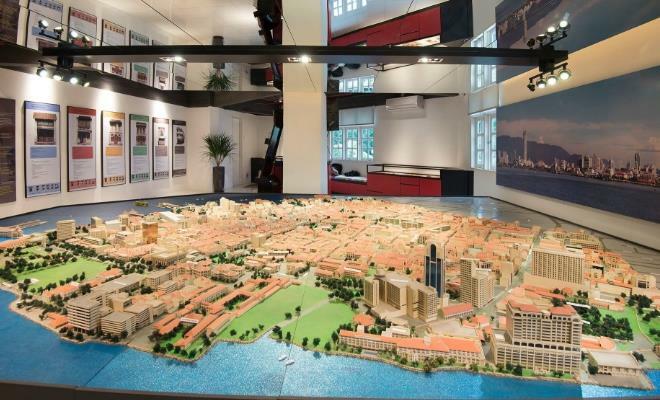 It features a 16 x 18 foot model of George Town World Heritage Site, sponsored by Think City Sdn Bhd. The Interpretative Centre is contributed by Giat Suria Sdn Bhd to be used for 15 years. 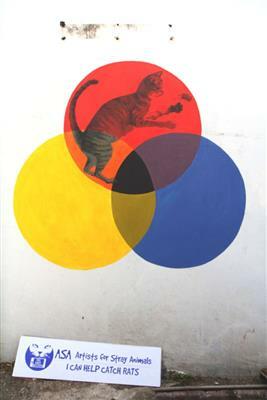 This piece of artwork was created as part of the 101 Lost Kittens project. 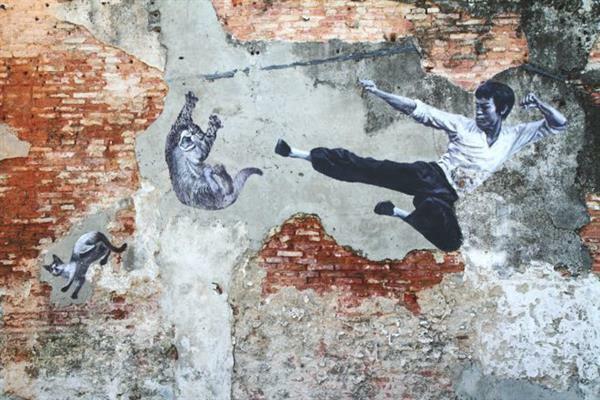 It depicts a cat prancing after a rat. 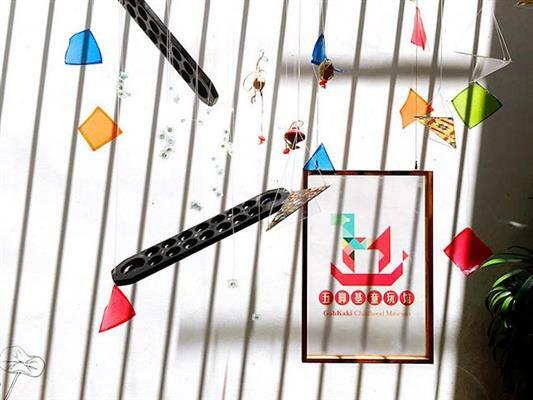 Enjoy decorative glasswork at this one-of-a-kind museum in Malaysia. Admire the different techniques in creating glass ornaments including fused, sandblasted, stained and overlaying glass. 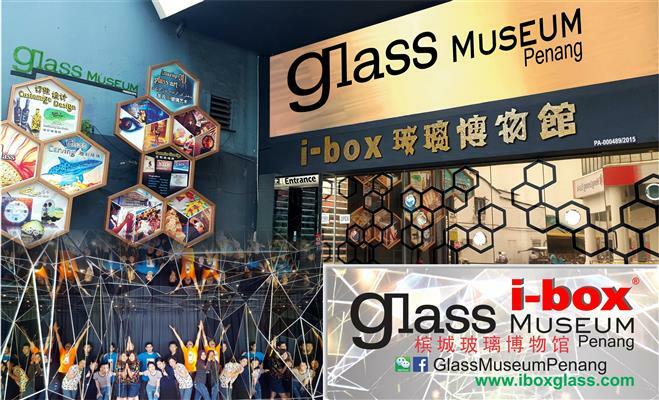 Ibox Museum of Glass is the first glass museum in Malaysia, and have received a title in the Malaysia Book of Records for being the first glass museum. The Penang Immigration Department Building is an impressive double storey building . It was built in 1890 and is located within the compound of the Central Police Station. The building has a porte cochere facing north. India House is a double-storey building in George Town. It is located on the corner of Beach Street and Church Street Ghaut. It carries an address on both streets. India House was built in the Indian Art Deco style. 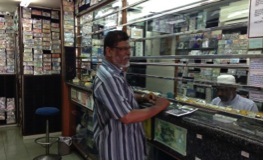 M. Thana's Goldsmith is the last remaining traditional Indian goldsmith in George Town which retails only hand-made jewellery. 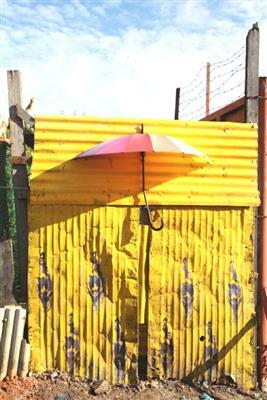 The shop was established in 1923 by Mr Nagumani one of the city's most respected craftsman. When he passed away his niece Thanalaxmi Veerappan took up the reins with her goldsmith husband, Raju. 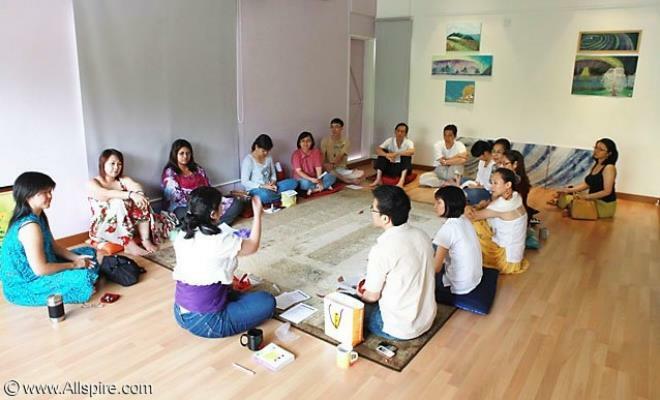 Inner Peace Yoga Circle is a yoga centre located in Pulau Tikus. 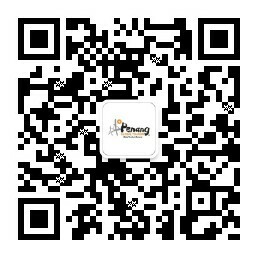 Ip Man Wing Chun is a martial arts centre that is founded by the principles of Wing Chun martial arts. The striking of the lone ironsmith's hammer can still be heard along the street where once every tool had to be fashioned by heat and hand not machines. 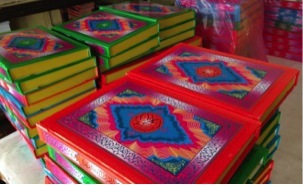 The Almuarif Press is the largest publisher of Islamic books in Malaysia with a backlist of 500 - 600 titles including numerous national best-sellers. The company currently has two printing presses in Penang and Bangkok to cope with thriving market demand. The Koran remains a best-selling text and the Press publishes a variety of different editions and retails a variety of book stands. 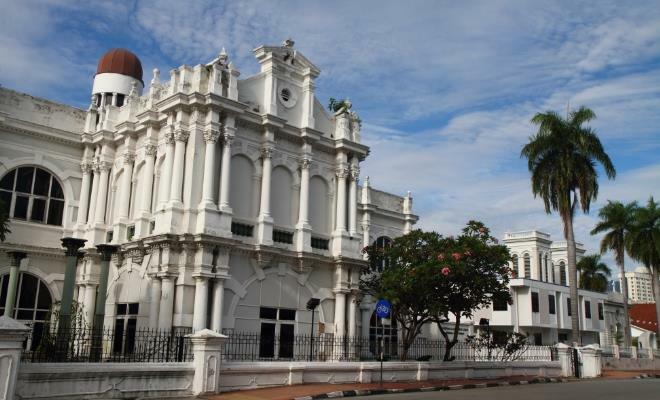 The Penang Islamic Council Building is a double storey Neoclassical- style building along Beach Street in George Town. It was part of the government offices during British Administration. The building is constructed in 1907. 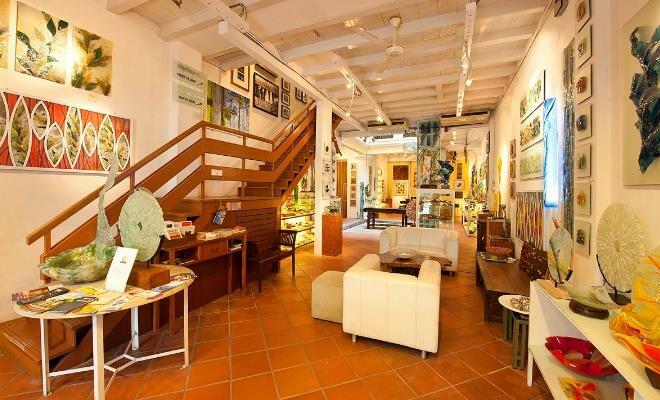 Island Gallery is situated on Jalan Phuah Hin Leong and managed by homegrown artist Cheong Mei Fong. 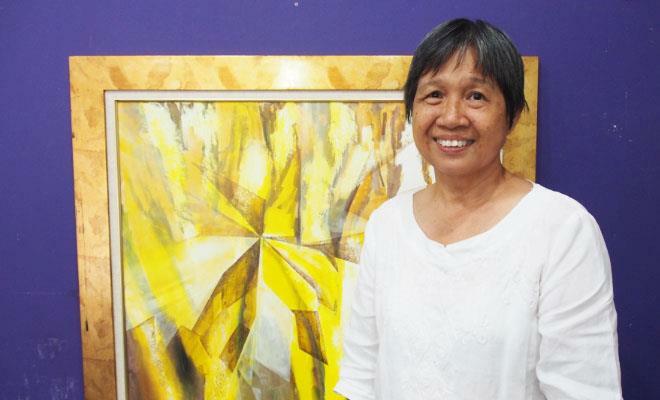 Local art exhibitions are held here regularly and if you're into perfecting your artistic skills, Madam Cheong offers classes in jewellery and sculpture making as well as painting. Istana Kedah or Kedah House is the residence of the Sultan Kedah in Penang. It is located along Northam Road and designed in the European Gothic style. it is not open to the public. 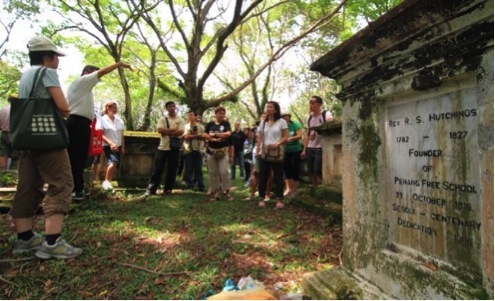 Japanese Cemetery is located in Lintang P Ramlee. It is the final resting place of the small community of Japan during the late 19th century. 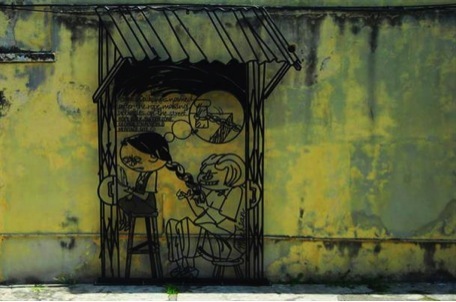 They immigrated to Penang to seek a better life. Jatomi Fitness boasts a spacious functional training zone and free weights area that satifies all fitness levels. It offers a range of group fitness classes, Les Mills programs, zumba, yoga and more. Penang Jewish cemetery is the oldest Jewish cemetery in Malaysia. The oldest tombstone dates back in 1835. There are approximately 107 graves. This is the place where the famous shoe designer, Jimmy Choo, started his apprenticeship. 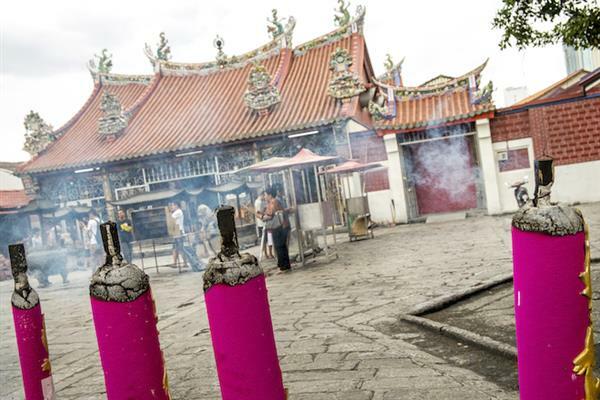 81 year old Mr. Lee Beng Chuan has been making joss sticks since he left school. Mr. Lee and his wife makes the joss sticks at their rented pre-war shop house located near to the Goddess of Mercy Temple. Nasi Kandar originated from Tamil Muslims. Hawking home cooked curry dishes and rice from containers slung on both ends of a Kandar (Wooden Stick). Kar Yin Fee Kuan is a Hakka district association of clansmen from the Kar Yin District of Guangdong Province in southern China. It is founded in 1801. The present building of the Kar Yin Fee Kuan dates to 1939. Kek Lok Si Temple is the most well known temple on the island and also known as Temple of Supreme Bliss and was founded in 1890. The temple consists of prayer halls, pagodas and bell towers . 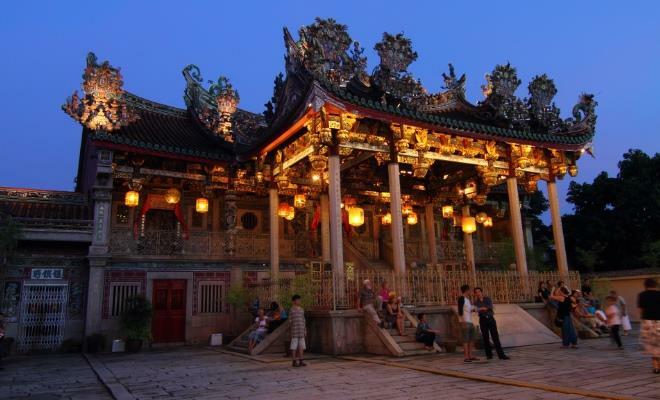 Khoo Kongsi is the mark of the dominant presence of the Chinese in Penang and it is a large Chinese clanhouse. The temple was rebuilt in 1920 after it was burnt down in 1894. 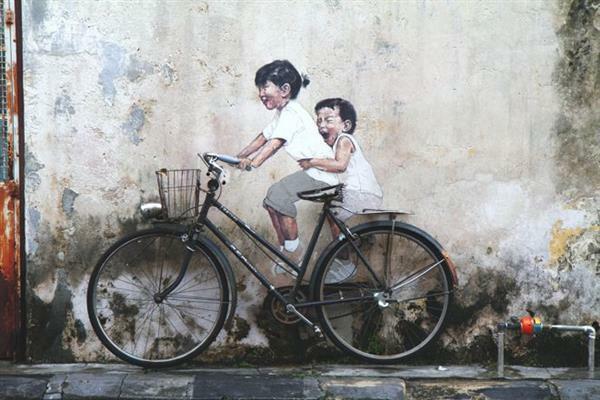 The "Kids on Bicycle" mural located at Lebuh Armenian is painted by Ernest Zacharevic, a young Lithuania-born artist. 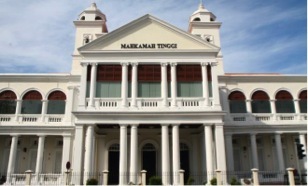 The former King Edward VII Memorial Hospital Building is now used as Museum at Macalister, a branch of the Penang State Museum. King Street Temple is a Taoist temple run by the Cantonese and Hakka community. It was divided into three bays, with ornate windows in the middle bay. On the other side of the temple are side bays with act as living quarters. 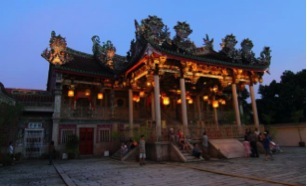 Tua Pek Kong Temple is a Taoist temple within the George Town UNESCO World Heritage Site. It is located at 32, 32A & 34 King Street, sandwiched between the Heong San Hoay Kuan and the Nin Yong Temple, and it gave King Street its Chinese name, Kuin-Tang Tua Pek Kong Kay, meaning Cantonese Tua Pek Kong Temple Street. 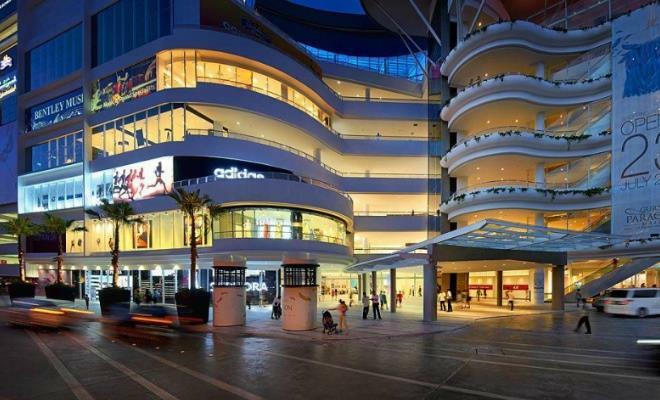 Komtar consists of retail outlets, transportation hub and administrative office for the Penang State Government. Komtar is one of the cutting-edge buildings in Penang. Kongsoon House is a commercial building at the corner of Church Street and Beach Street. It was built in 1914. It supplies mining, industrial machinery, catering to the booming tin industry. The façade facing Church street has a centralised front with pediment and projecting balconies on the first and second floor. One Tall, Double Shot, Decaf Espresso KOPI-O’-KAU! Kun Kee Food Industries is a George Town success story of a small coffee roaster that has expanded and diversified its products for the export market. The company's famous blend of 'Kopi O' is sold in coffeeshops throughout Malaysia and consist of coffee beans roasted with sugar, margarine, salt and sesame seeds. 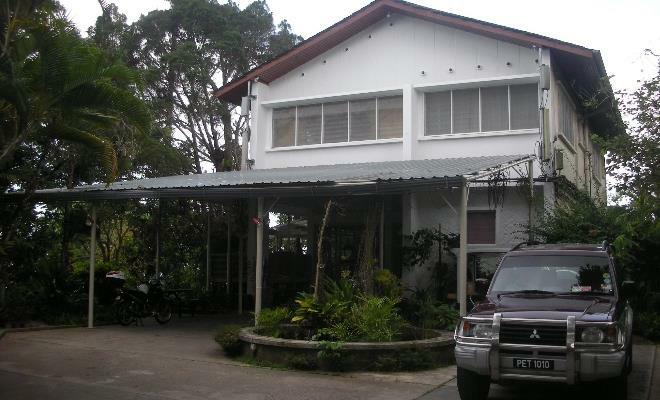 Bodhi Heart Sanctuary is a non-sectarian Buddhist Society located in Tanjung Tokong. 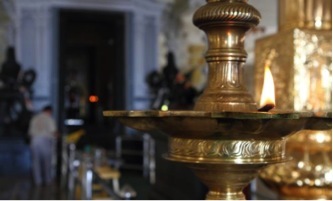 The sanctuary offers a wide variety of spiritual programs to assist in discovering a more balanced, meaningful and fulfilling lifestyle, one of which includes a Kundalini yoga class. 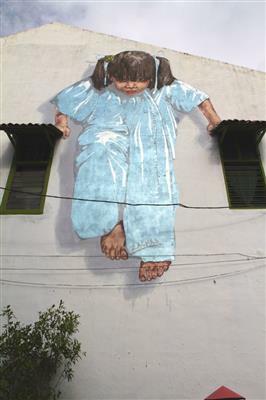 "Kungfu Girl" is a giant mural of a girl trying to lift herself up with both her hands on the window. Kwangtung Tengchew Association incorporate Chinese designs hybrid with Western design but still represented traditional and religious purposes. Lee Association located at King Street and an association for surnamed Lee. The building has Straits Electric influence surroundings. Leong Fee Mansion is a two-storey bungalow which is located at the junction of Leith Street and Northam Road, opposite the Cheong Fatt Tze Mansion. It was built in the 1900s as a personal residence and today is an art school, Akademi Seni Equator. Boon San Tong is the ancestral temple of the Khoo subclan known as the Hai Kee Kak, or 'Sea Edge Pillar'. 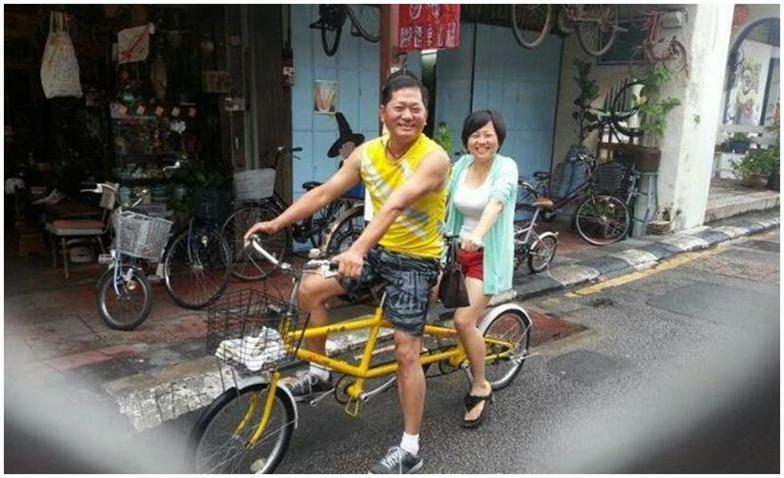 They are the descendents of Khoo Kong Oon, a fifth generation Leong San Tong Khoo. 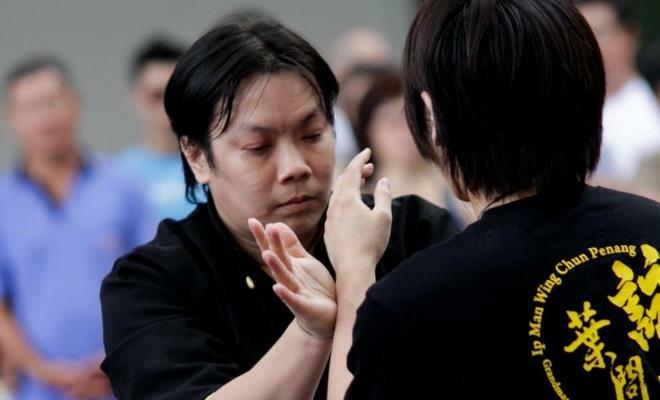 The most illustrious member of this subclan is Khoo Thean Teik, who was instrumental in making Boon San Tong, the most powerful component of the association. Leong Yin Kean is a historic building converted into night club and has Italian influenced villa design and was built around 1926. The Li Teik Seah Building is a two-storey bungalow and was home to the wealthy 19th century pepper trader Khoo Tiang Poh who is a prominent member of the Khoo Kongsi. 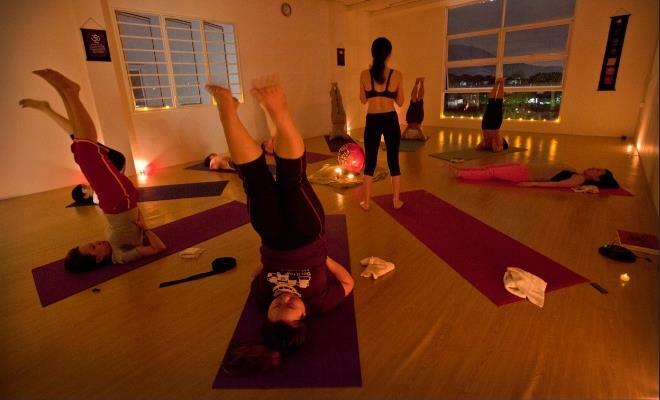 Lifeworks Holistic Centre is a yoga and pilates centre located in Pulau Tikus. Lim Kongsi, also known as Hall of Nine Dragons is located at Lebuh Ah Quee and it was founded by the Lim clan. Lim Lean Teng Mansions is not a residential mansion but a three-storey office block along Farquhar Street in George Town. The ground floor is occupied by car showrooms. Lim Lean Teng Mansions was built by Ho Kim Teik, who established Georgetown Motors in 1913 to sell different makes of cars including Page, Empire, Austin, Stoneleigh and Mitchel. Limburg is one of the historic buildings in Penang that has been converted into a fast food restaurant (KFC). Oi! You call this limousine!? 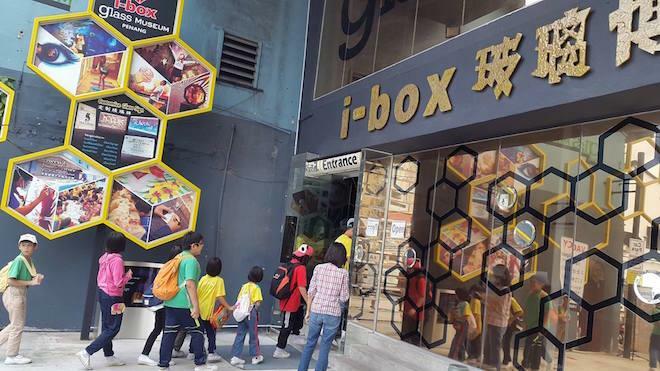 This was the place to go for Chinese books, stationery, coffins and paper effigies. All the pleasures of the material world can be reproduced in paper and burnt as gifts for the hereafter. Ling Ling Fashion Sewing School offers sewing classes for beginners and advance students. Some of the skills you get to learn are basic body measurement and pleating methods as well as ways to sew dinner dresses and traditional clothing. 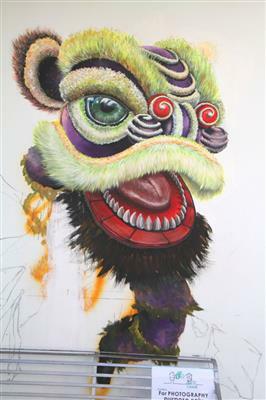 "Lion Dance" is a traditional dance performance that mimics a lion's movements. 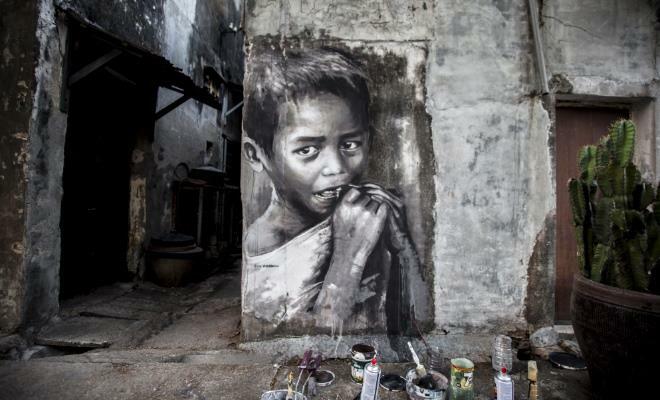 Russian artist Julia Volchkova painted a black and white mural of a 'Little Boy', inspired by a photograph taken in Indonesia by her friend. 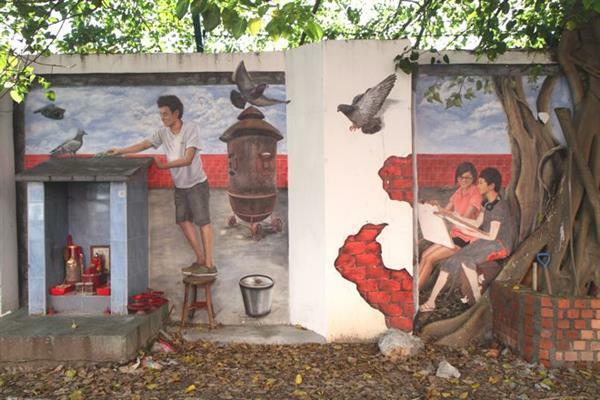 This mural is located in Prangin Canal, George Town. 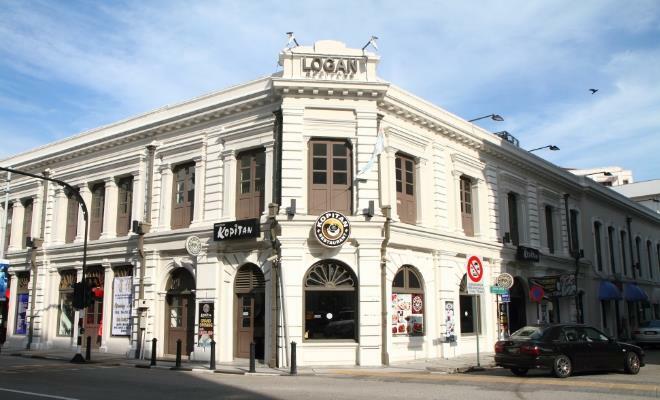 The Logan Heritage is a renovated and restored colonial building with an inner courtyard. The 2-storey pre-war building now houses various businesses and shops. 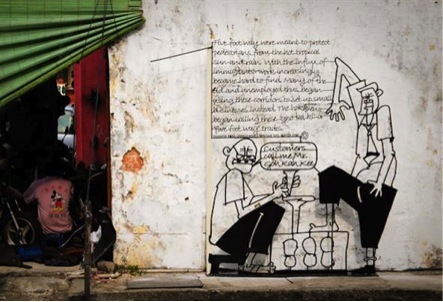 Address: Lebuh Pantai, George Town, 10300, Penang, MALAYSIA. The Logan Memorial is a monument erected in memory of James Richardson Logan, who was a champion of the rights of the non-Europeans in Penang. When the authorities attempted to suppress the activities of the Chinese clans, labelling them as secret societies, it was James Logan who helped the Chinese merchants in submitting petitions. This resulted in greater rights and recognition for their organisations and festivals. 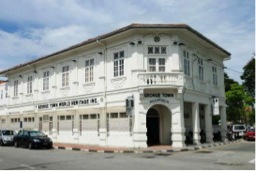 Loke Thye Kee is a restored historic building at the junction of Burmah Road and Penang Road. 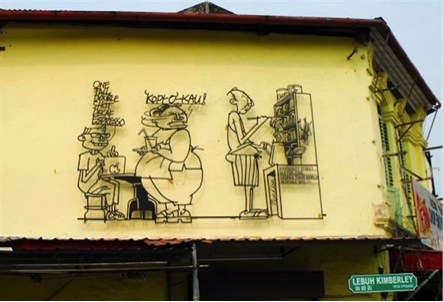 In its heydays, Loke Thye Kee was one of the most upmarket Chinese restaurant in Penang. The three-storey restaurant was designed by Penang-born architect Chew Eng Eam, who also designed the Chinese Chamber of Commerce building. The structure is supposed to resemble a steamboat as though afloat in a lake. 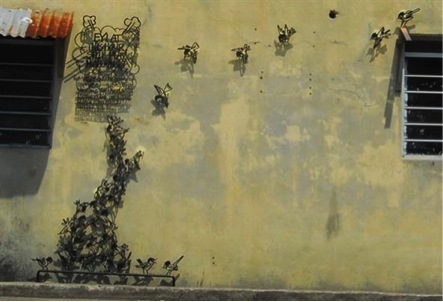 "Love Me Like Your Fortune Cat" is one of the murals painted by ASA, Artists for Stray Animals, in George Town, Penang. Fortune cats are cat dolls that are often found in Japanese and Taiwanese restaurants, near the cashier. 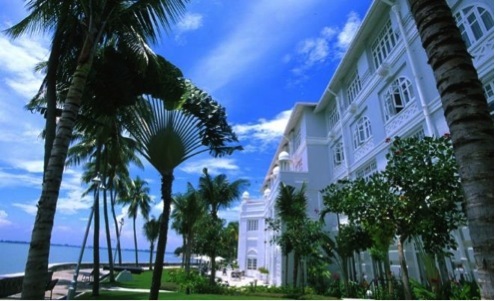 Lum Fong Hotel is a budget hotel and it was the original premises of the Penang Adventist Hospital. Today it has been converted to a coffee shop, bed and breakfast and bistros. Lung Yen Association is a clan association for Hokkien people who hail from the city of Longyan in Fujian Province, China. It was built in 1950 with Art Deco style influenced with a touch of Shanghai plaster. 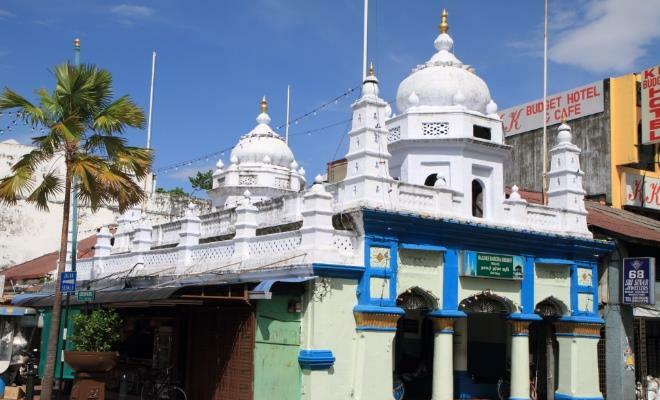 The Nagore Shrine was built in 1800, and is the oldest Indian Muslim shrine in Penang. It is well-kept and painted in white. The Nagore Shrine is one of the remaining architecture in early 19th century. Obviously, this is less than five feet…The ‘Five Foot Way’ of Wan Hai Hotel is said to be the narrowest in Penang. Nattukottai Chettiar Temple, also called the Arulmigu Thandayuthapani Temple was founded in 1854. 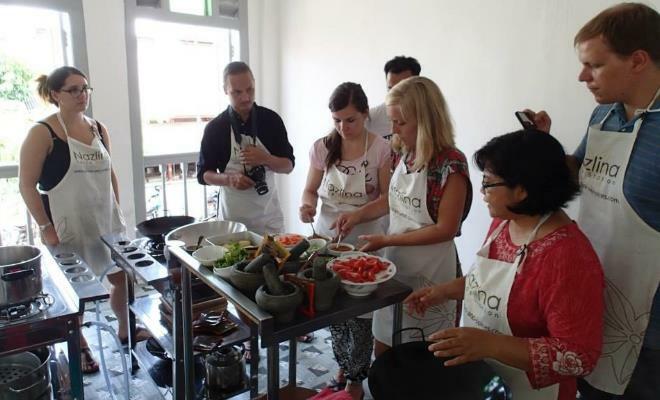 Purely hands-on cooking experience, expect to learn the art of preparing local delicacies from assam laksa to roti canai and dhal curry from Nazlina Spice Station. Your day begins with a walk to the nearby Campbell Street Market where you will shop for fresh ingredients before making your way to her kitchen on Lebuh Campbell. Apart from being a cook herself, she's a certified tour guide by the Ministry of Tourism Malaysia that lends her knowledge about the sights and sounds of Penang. Ng Fook Tong Temple was built in 1898. Kapitan China Chung Keng Kwee brought craftsmen from Fook San in China to work on the temple. Leong See Kah Miew Traditional Chinese is the clan association of the Chinese holding the surname Leong. The name Leong See Kah Miew translates as Leong Clan Ancestral Temple. The three-storey association premises is at 65 Perak Road. Mr Chen of Ngai Sun has been in the business for a long while. 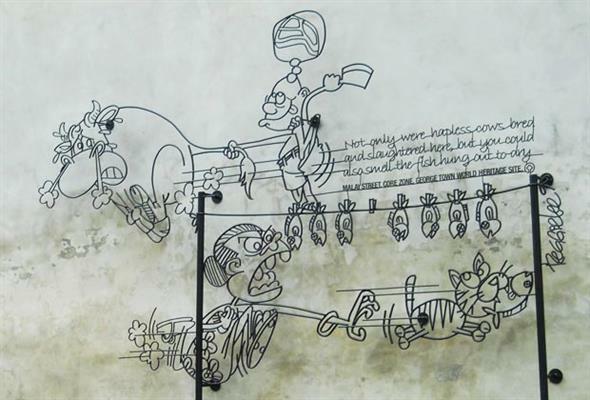 At his shop, all artworks are hand paintrd onto the blinds rather than spraypaint. 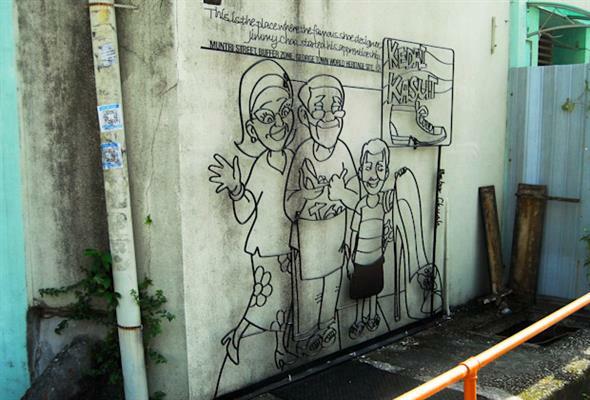 All this is done in a narrow little alleyway at the back of the shop. 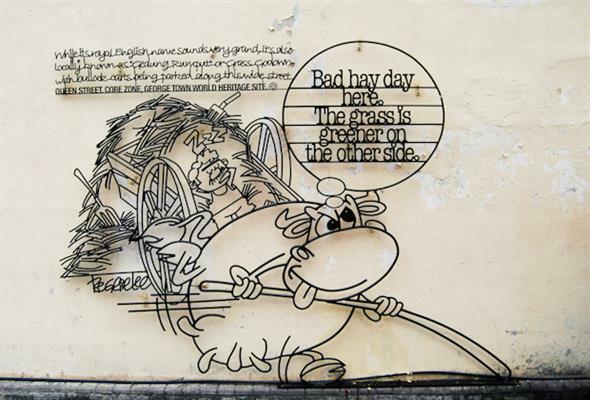 "No Animal Discrimination Please" is one of the murals painted by ASA, Artists for Stray Animals, in George Town, Penang. Transfer Road is named after the event of the transfer of Straits Settlement from Indian office to colonial office in Singapore. In 1867, resulted in a more efficient admin station and an era of great prosperity of the crown coloneles. 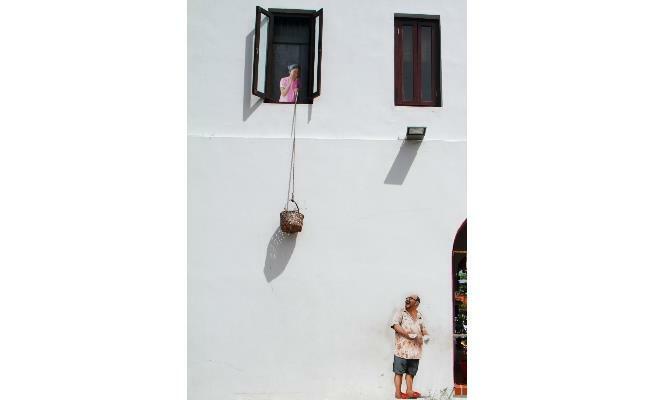 A petty-trading neighbourhood, where you can find activities such as drying of salted fish and basket weaving. Also known as Noordin Family Tomb or Makam Keluarga Noordin, is located facing Chulia Street next door to the original main entrance of the Kapitan Keling Mosque. The mid-19th century mausoleum of Indian Muslim merchant Mohamed Merican Noordin which also housed a school for the Muslim community. He was buried here in 1870. 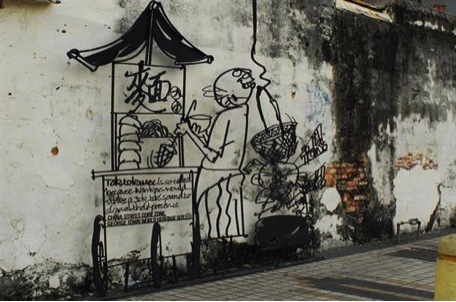 Depicts a young Nyonya maiden receiving by basket a meal of noodles from the hawker on the street. Wisma Oh Kongsi is an office building along Weld Quay, in George Town, Penang. The 5-storey building belong to the Oh Clan Association. It is a surname clan association comprising three organizations: Tay Koon oh Kongsi, She Foo Kongsi Ann Teng Tong, and Teng Bee Oh Toon bok Tong. It was officially established only recently in 1988 and its members can trace their origin to their progenitor, Nian Ba Lang. 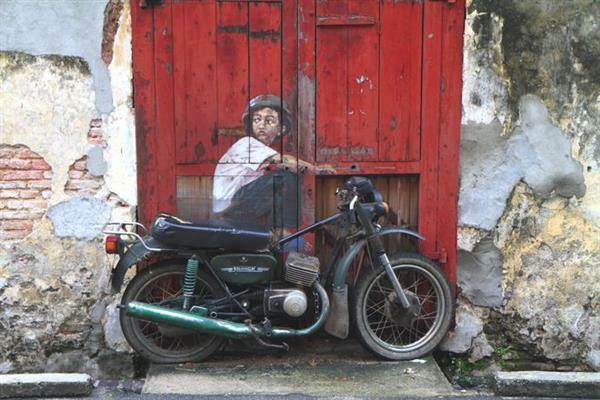 The "Old Motorcycle" mural on Lebuh Ah Quee is painted by Ernest Zacharevic, a young Lithuania-born artist. Old OCBC Building was built in 1938 in the Art Deco style with Shanghai plaster. The OCBC logo is still there since 1930's. 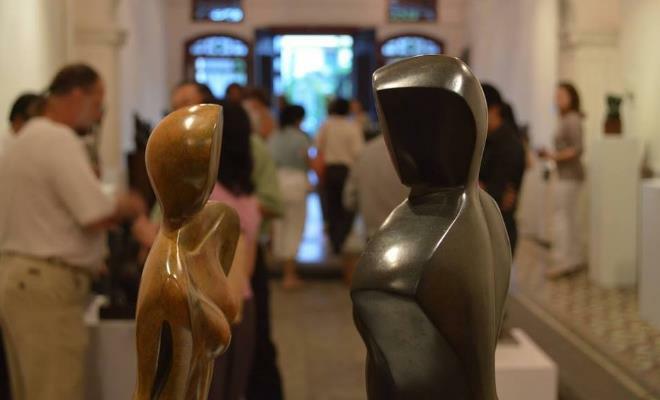 Established in 2011 by collector and artist Ch'ng Huck Theng, One East Museum showcases a permanent exhibition of an impressive collection of famille rose figurines dating back to the mid 19th century. The ‘Black and White’ Amahs were Cantonese domestic servants from Guangdong who did all kinds of household chores, and would refer to themselves with wry humour as ‘’Yat Keok Tet’’ (One Leg Kicks All). 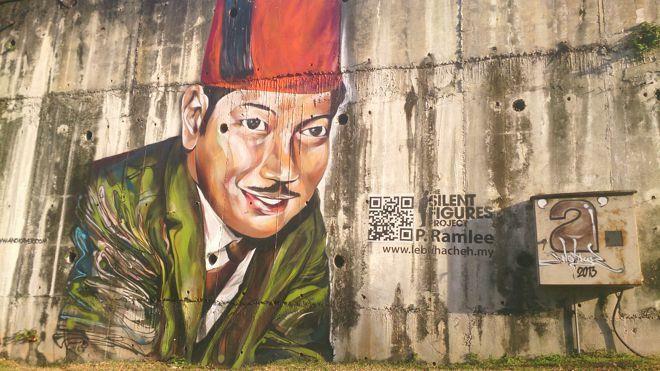 The P. Ramlee mural located at Batu Uban, Gelugor, Penang is part of The Silent Figures Project by Lebuh Acheh Interpretation Centre, Penang. 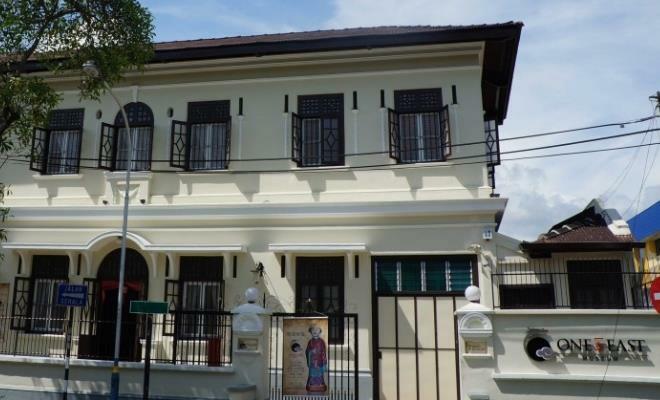 P.Ramlee's Birth House highlights his personal collections including his old violin, favourite shirts, old movie posters, typewriter and more. 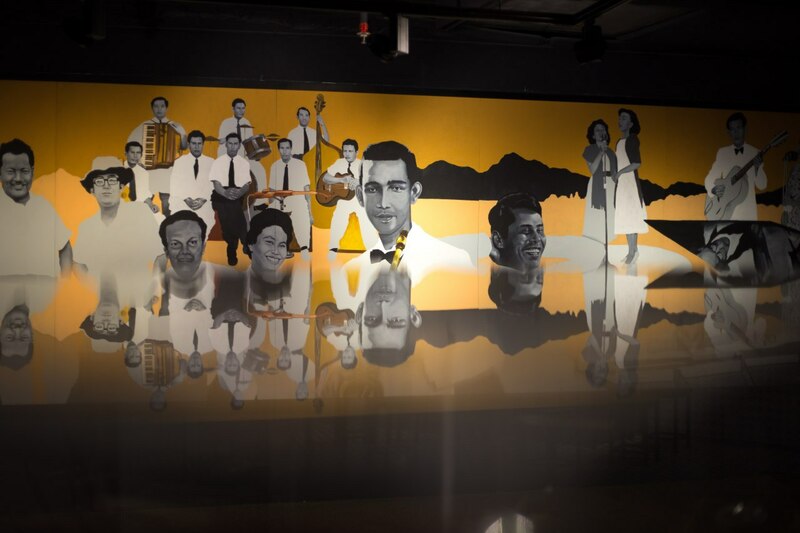 Housed within the Kompleks Pustaka Warisan Seni, the P. Ramlee Gallery is built to remember the legacy of Malaysia's renowned director, actor and composer P. Ramlee. In the gallery, you'll find old memorabilias of various sorts from classic posters of the movies he acted to his favourite old flute. Pak Tong kou (steamed rice flour cakes) and ham chim peng (deep fried pancakes) are two traditional Cantonese pastries. According to Chinese custom, miniature paper replicas of houses, servants and wordly possessions (cars, mobile phones, watches etc.) are burnt as offerings to the newly deceased to accompany them on their new life in the afterworld. 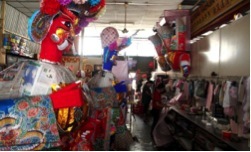 Aside from paper houses, the shop also makes giant paper effigies of Chinese gods which are used to commemorate deities' birthdays and religious festivals. Leong How Keng's tiny bakery shop is famous for its coconut tarts. Only 300 tarts are made each day, so customers make a bee-line to the bakery bright and early each morning! Amazing World Studios is a smart partnership between Oxtra Capital Sdn. Bhd. and Warner Brothers. It features hands on exhibits and fun family activity. Possessing a camera is a prerequisite for visitors who wants to experience the unique side of Amazing World Studios. Featuring pop up art exhibitions, interactive computer generated animation and 3D settings, visitors will enjoy every moment spent there. It’s Facebook/ Instagram moment at every step. 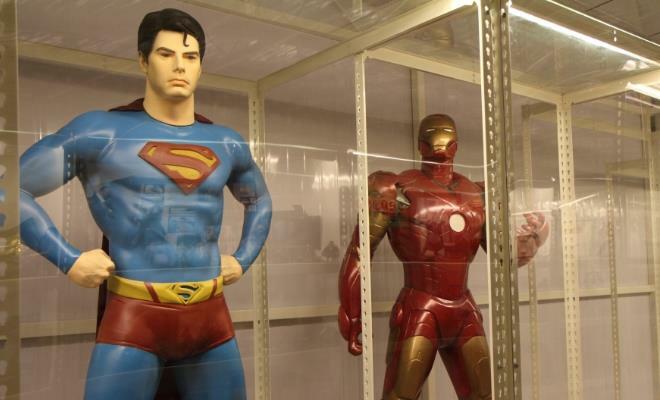 The museum, proudly a first-of-its-kind in this part of the world, showcases many of the active and pioneering icons in the comic/cartoon industry. 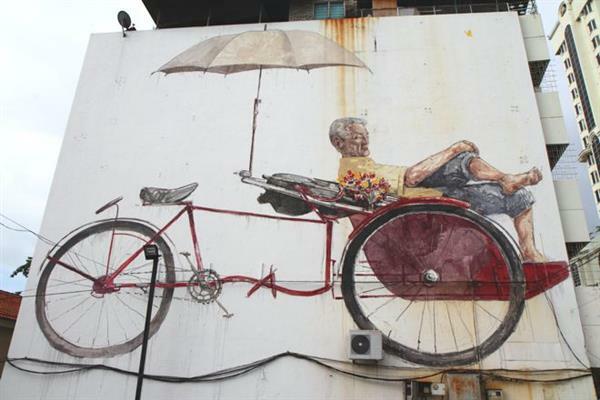 Located at Lee Jetty, Penang Cycle Bay offers bicycle rentals daily. 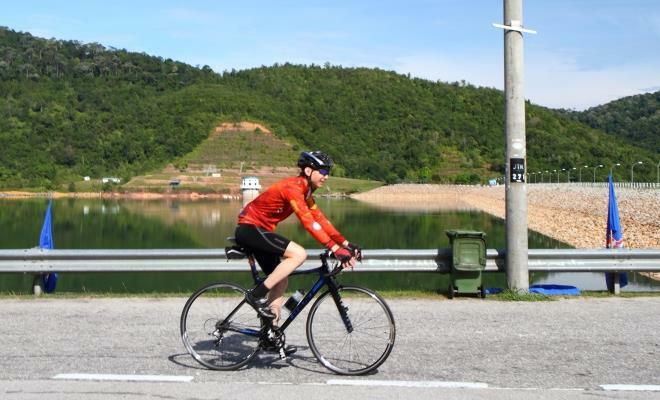 The rental begins from RM12 per bicycle on weekdays and RM15 per bicycle on weekends. Penang Forestry Museum or Muzium Perhutanan Pulau Pinang, is a museum that was set up to generate greater appreciation among the general public for the rainforest in Penang. Constructed in 1976 and first opened to the public in 1983, the museum covers a 700 sq meter site. It was constructed using various types of wood. The main exhibition hall is supported by the trunk of a single forest tree. Penang Forestry Museum has exhibits showcasing the different types of wood and wood products. There are eight dioramas showing the different types of forest including the mangrove swamp forest, swamp forest, coastal hill forest, lowland dipterocarp forest, hill dipterocarp forest, upper hill dipterocarp forest, montane oak forest and montane ericaceous forest. The museum is really geared towards educating children and school students. 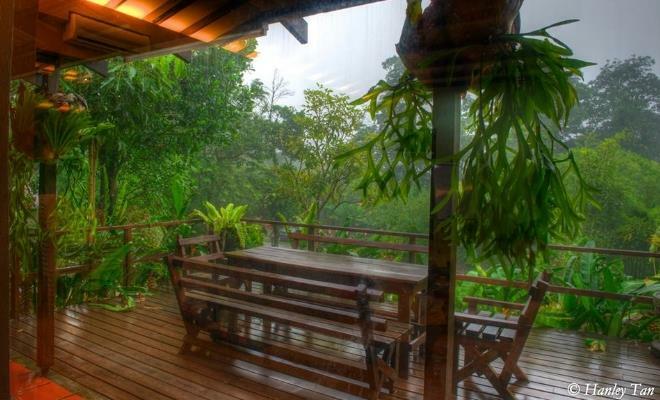 Due to its proximity with the Batu Ferringhi tourist belt, it receives a small stream of tourists. The Penang Fun-Filled Wax Museum has over fifty life-size wax models of celebrities, ranging from artistes to politicians to royalties. 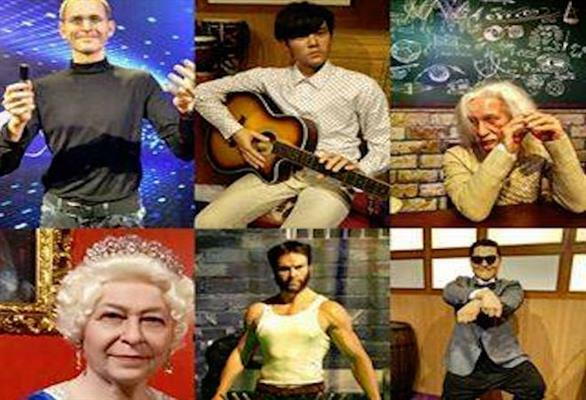 Among the wax characters on displays are Mr Bean, Hugh Jackman, Queen Elizabeth II, Jackie Chan, Teresa Tang, President Obama, Pablo Picasso and Steve Jobs. 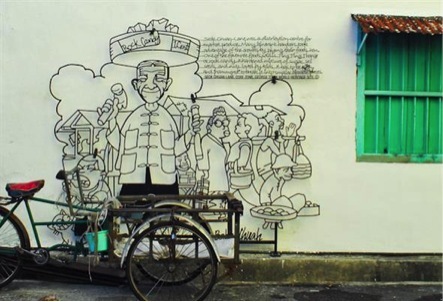 The Penang Heritage Trust (PHT) was established in 1986 as a charitable NGO, dedicated to promoting Penang's cultural and built heritage. 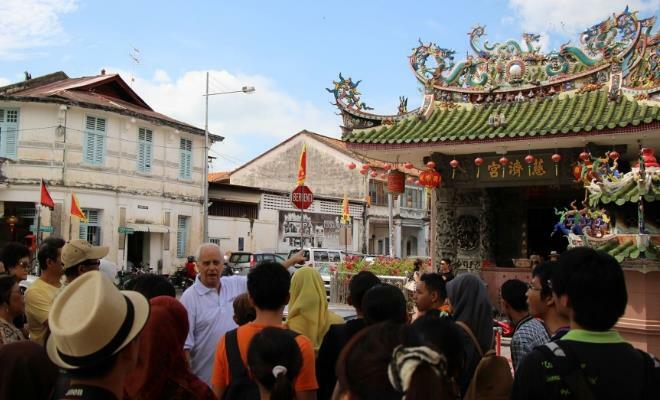 Its objectives are to promote the conservation of Penang's heritage, to facilitate cultural educational programmes, to organize public awareness programmes and to cooperate with other like-minded organizations in Malaysia and abroad. 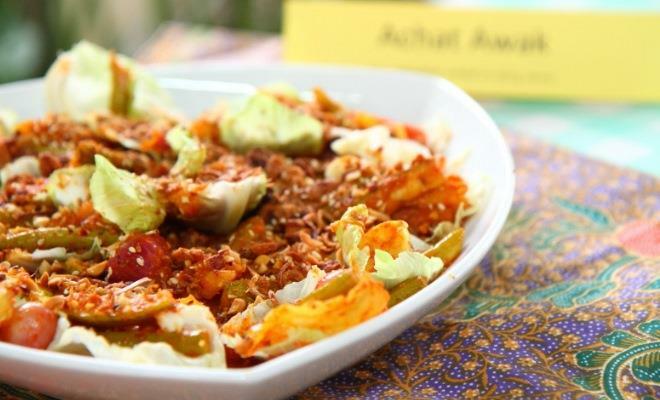 Led by Peranakan food maestro Pearly Kee, learn to prepare Nyonya homecooking dishes such as Nyonya stir fried pork, nasi sambal fried rice, pineapple sweet curry and more. 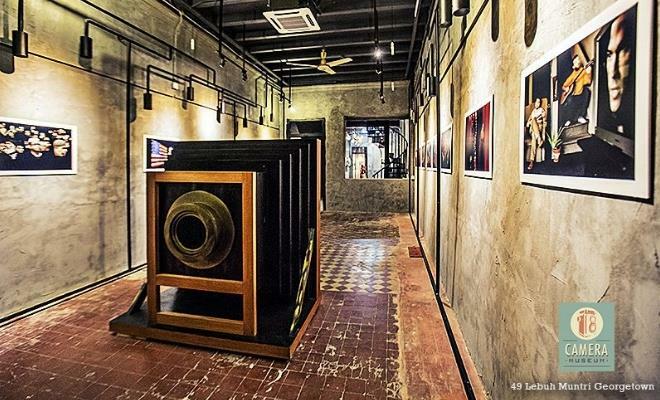 Immerse yourself in the forgotten musical heritage of Penang with exhibits and interactive features, with a spotlight on the traditional music of Penang's diverse communities; the defining period of the 1930s to the 1970s; as well as musical icons that have shaped the music of Penang and Malaysia. Penang Islamic Museum is known as the Syed Alatas Mansion. It displays the history of Islam in Malaysia through a number of 19th-century antiques. 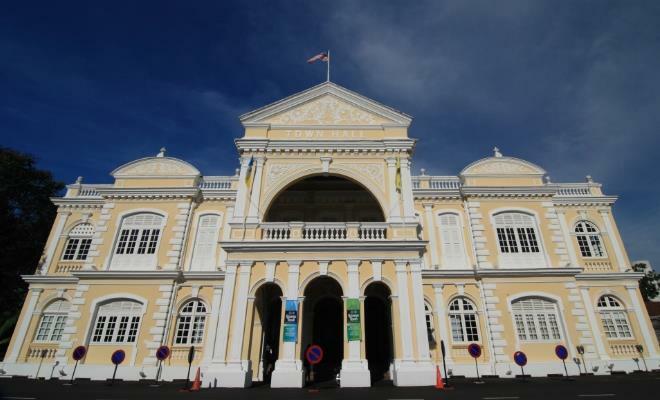 Sun Yat Sen Museum is a historical museum that revolves Asian nationalist figure of the early 20th century, Dr Sun Yat Sen.
Penang Supreme Court Building was built in 1809 and designed in the Palladian style. 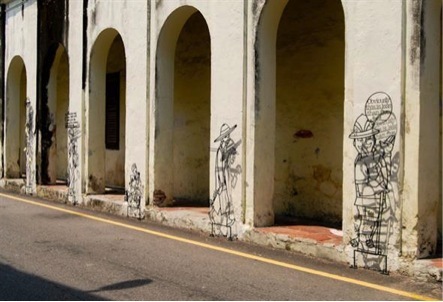 Located on Jalan Green Hall, the Penang Time Tunnel features a fascinating layout that takes you back in time to significant periods of Penang history. 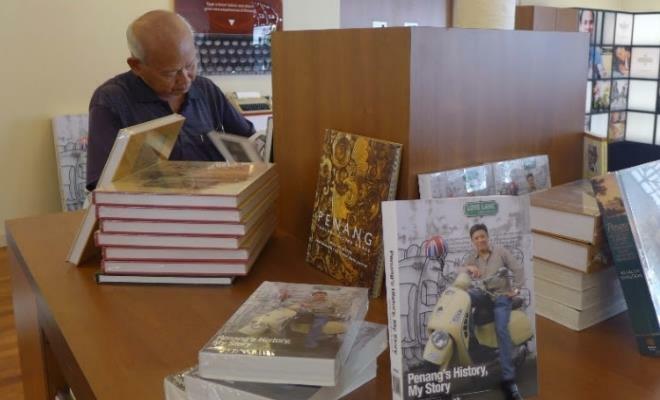 Some of the highlighted eras include 'The Founding of Penang' (1786-1794), 'The Growing Multi-Racial Population' (1795-1825), 'The Recession and Turbulent Years After Independence' (1957-1969), 'Penang Towards A Brighter Future' (2013 and beyond) and more. 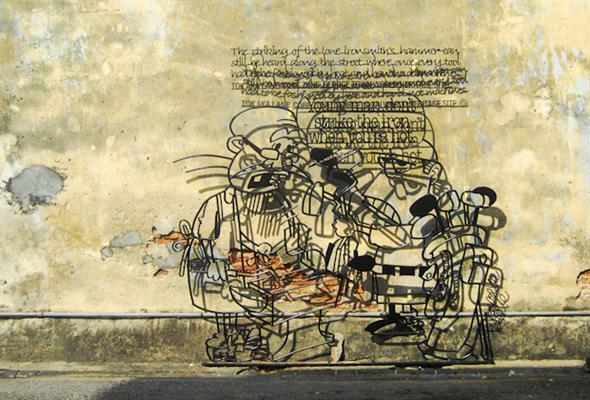 Interestingly, this timeline is captured through the creative use of interactive murals. Thus, providing a fun-filled trip for all. 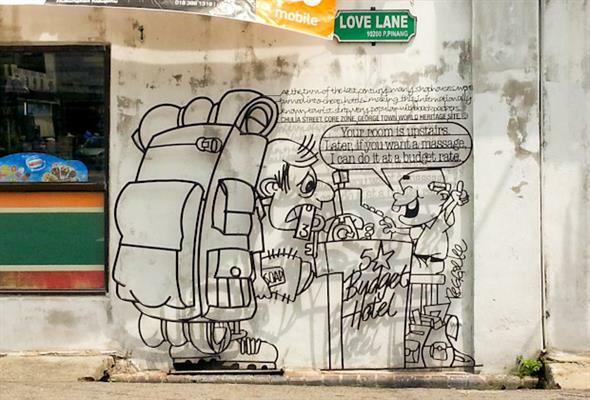 Penang Tourist Guides Association was founded on 27 September 1966 located at Cannon Street. 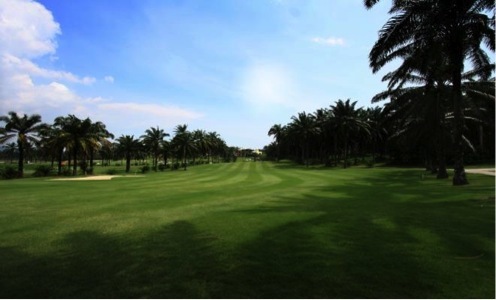 Penang Turf Club is a horse racing venue located at Batu Gantong. 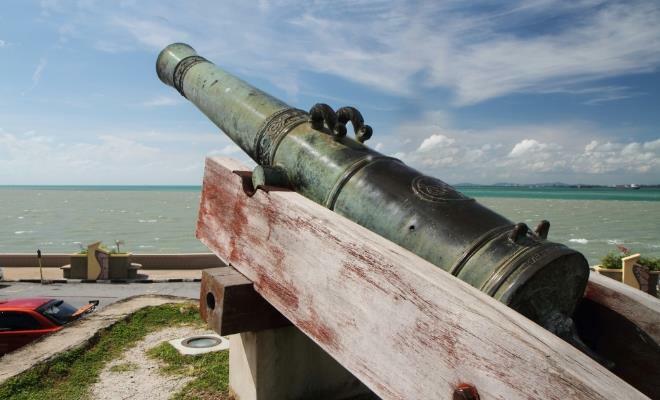 The Penang War Museum is a privately-run museum located on the hills above the fishing village of Batu Maung. The war museum is a monument to the mistake made by the British in thinking that the enemy would attack from the sea, and thus they constructed the bunkers and enforcement with cannons aimed to the sea. As it turned out, the Japanese invaded by land, coming down the Peninsula, and rendering the preparation moot. 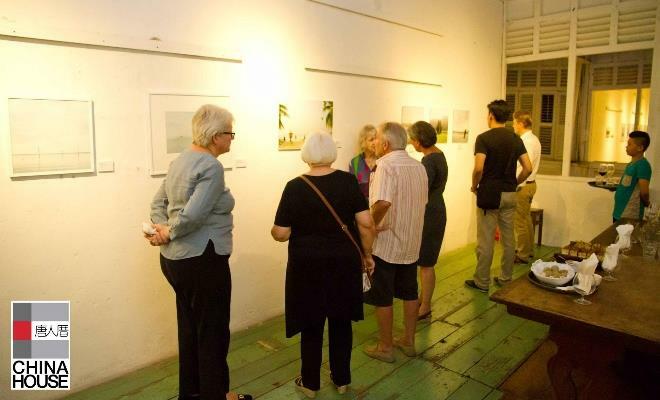 Founded in 1983, the Penang Watercolour Society is known for organising a series of art activities such as watercolour exhibition, seminar, demonstration, competition, art camp and more. 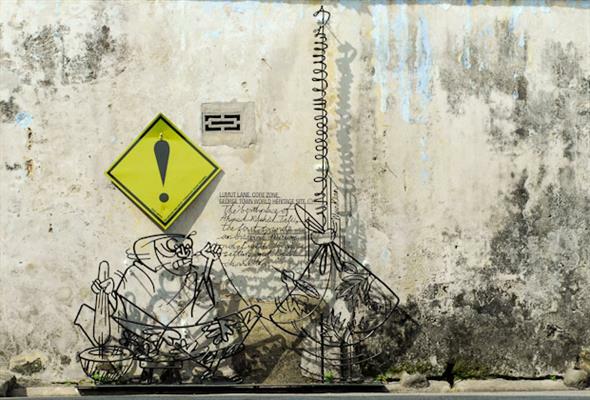 Penang: Present & Future depicts the time changed between the past and present. 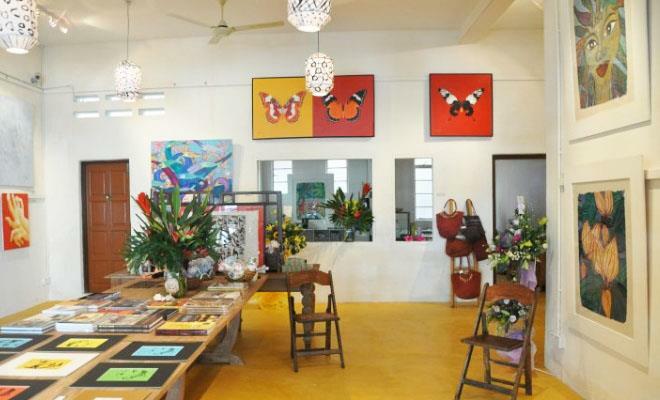 Pentique Gallery is a local antique shop specialising in traditional Nyonya apparels. S.M. Badjenid & Son established in George Town in 1917 is the country's oldest manufacturer, wholesaler and retailer of perfume compounds, essential oils, bakhoor and oudh. 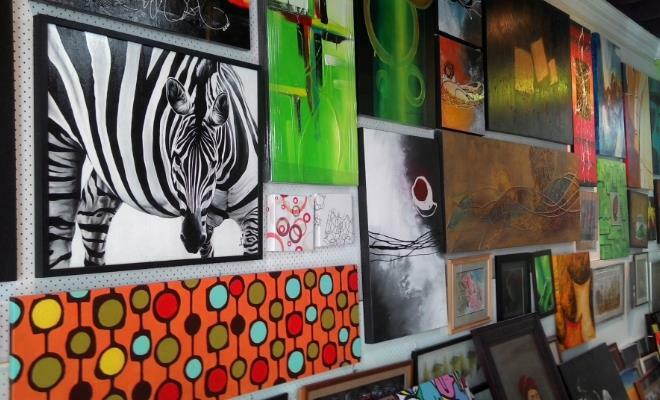 The shop also sells canvas and custom-made canvas products including tents and canopies. Now run by third generation family members, the shop is packed floor to ceiling with thousands of exotic halal perfumes and eau de toilettes (which do not contain any alcohol). 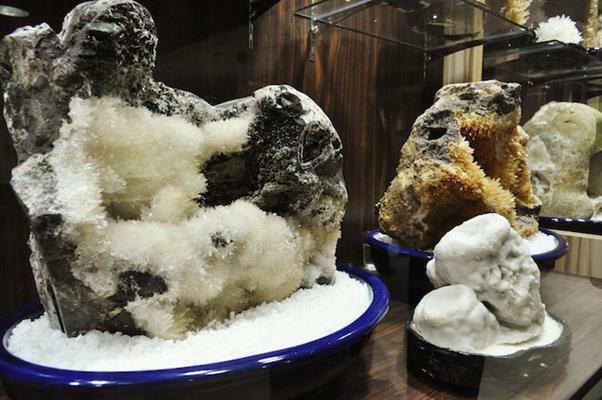 Experience the astonishing allure of gold at the PG Gold Museum. Public Gold is the first company in Malaysia to set up a gold museum for you to learn all about gold via exhibitions, demos and guided tours. Located in one of the heritage buildings in Penang, you'll find gold and silver collection from across the world that have been artistically crafted into myriads of designs. 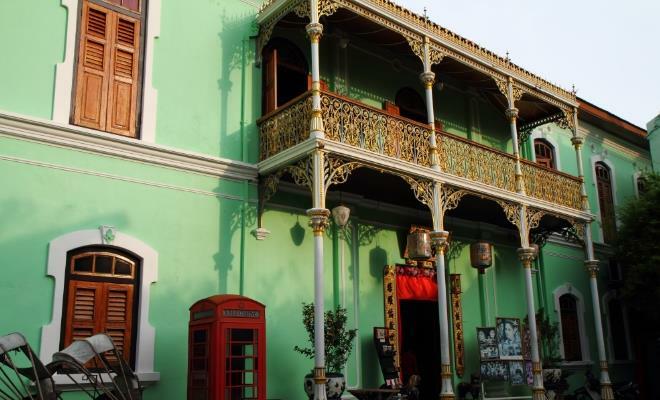 The Pinang Peranakan Mansion is one of the most ornate private homes in George Town. 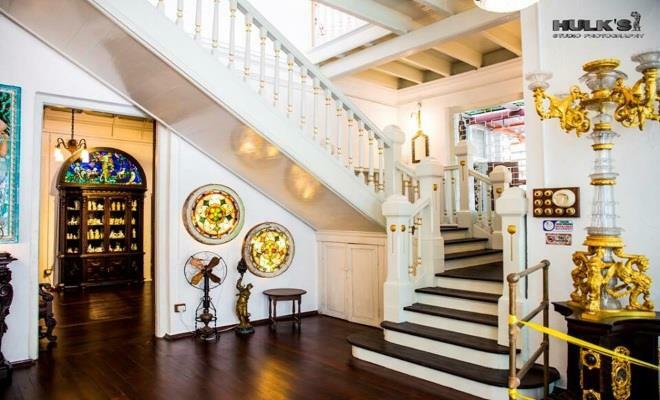 Built by one of the most illustrious personality in 19th century Malaya, the house has a long and colorful history. 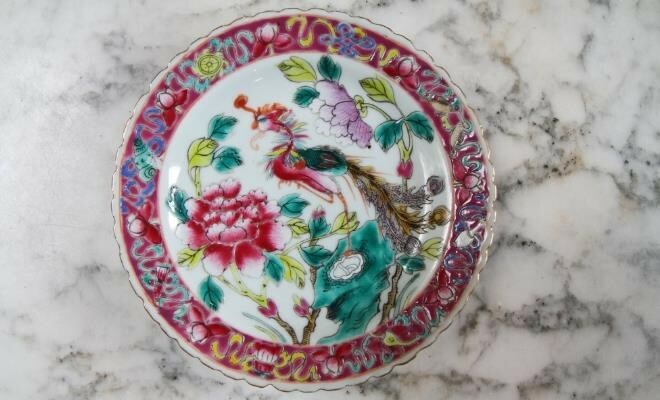 After decades of neglect, the mansion was bought by a property developer who restored and turned it into a museum to showcase his collection of Peranakan antiques. 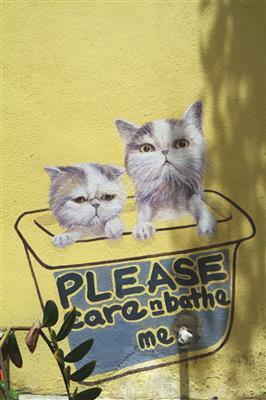 "Please Care & Bathe Me" is one of the murals painted by ASA, Artists for Stray Animals, in George Town, Penang. It shows two little kitten has been abandoned. Poe Choo Seah is an association for Straits-born Chinese, the Baba Nyonyas. It was built in 1902 with Straits Electric Style. Prangin Canal was originally a river that flowed into the swampy coastline as it emptied into the sea located near where the Sia Boey market used to be. Jothee is one of Penang's oldest printing presses established in 1935 by S. Letchumanasamy who arrived in Penang as a 10 year from India. Working at odd jobs from morning till night to support his family, the young man eventually saved enough money to open a printing press at the age of 19. 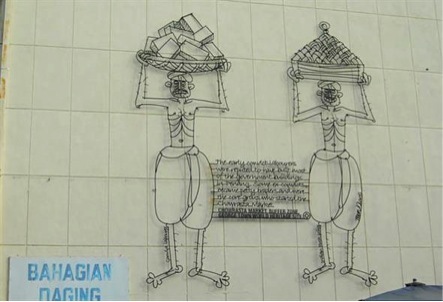 It was the first presses in Penang to produce locally made diaries and handmade accounts ledgers; today it is run by the founder's son Shanmuganathan. Tua Pek Kong fancy car parade in the year of tiger is to wash away all the bad luck, and bring in wealth and health. In the 1800’s, shops and godowns on Victoria Street were built at the Seafront. 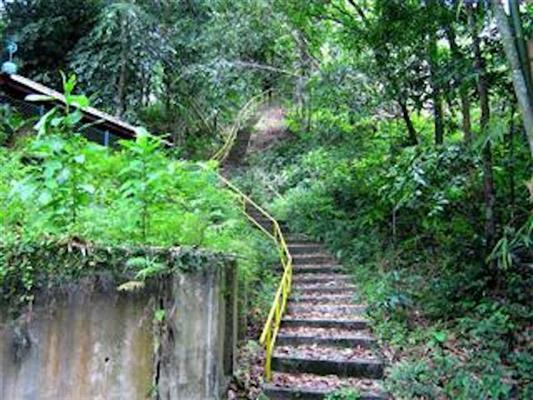 Discover Pulau Tikus for free with the recently launched shuttle service called 'Pulau Tikus Loop'. The shuttle bus offers free rides to areas such as Jalan Kelawei, Jalan Bagan Jermal, Jalan Burma and Jalan Pangkor. 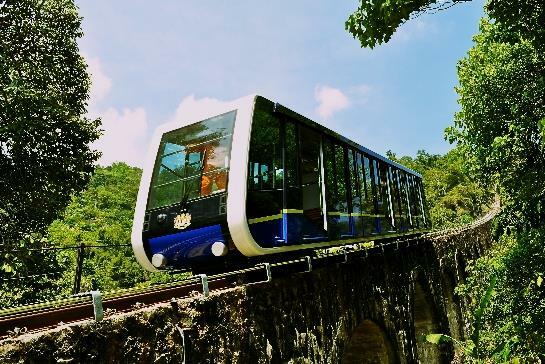 Catch these nearby attractions when you board the 'Pulau Tikus Loop' shuttle. Qi Yoga is a registered yoga school that offers regular classes, teacher training course, yoga workshops, yoga retreat, private classes and yoga for kids. Queen Victoria Diamond Jubilee Clock Tower was donated by local Penang millionaire Cheah Chen Eok in 1897 to commemorate the sixtieth year of the Queen's reign. To the dismay of parishioners of the Portuguese church there. 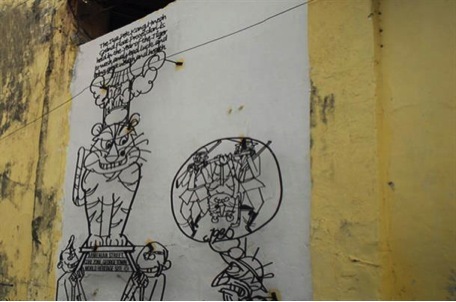 Church Street also housed the headquarters of the notorious Ghee Hin secret society. 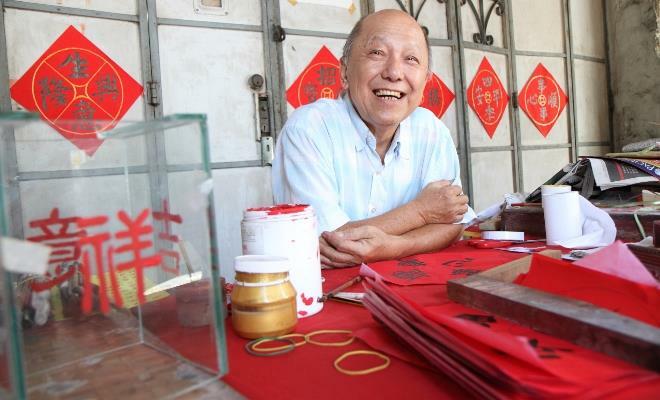 Veteran rattan weaver Sim Buck Teik is a 'Living Heritage Treasure of Penang'. He is a second generation rattan weaver who inherited his skills from his father in their home district of Teochew, China before the family moved to Malaya. Ren i Tang is the result of a two year long restoration project on a 19th century Early Straits Eclectic Styled Building located within the core zone of the UNESCO World Heritage Site. 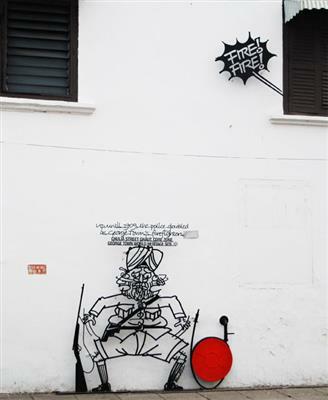 Campbell Street is Penang's Fifth Avenue, a retail paradise where shoppers can stroll along the row of shophouses and feast their eyes on an array of goods. Rope Walk was named after the rope making activities on the street. Roti Benggali came from the word Penggali (shareholders' in Tamil). 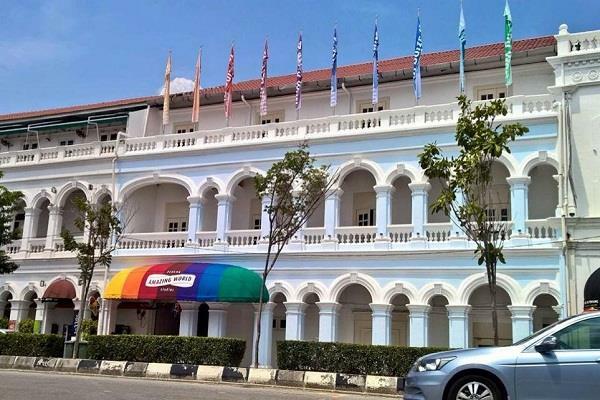 The Runnymede at Jalan Sultan Ahmad Shah, formerly Northam Road, is the name for a group of buildings located by the sea front in George Town, Penang. 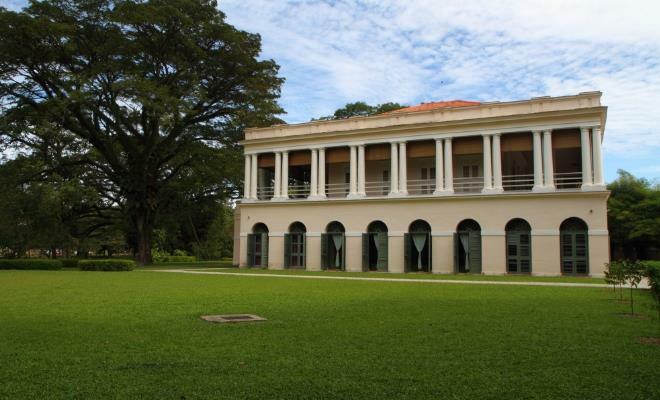 Also known now as Wisma Persekutuan, Runnymede is famous because Sir Stamford Raffles, who later founded Singapore, used to reside there when he was living in Penang. Here your find traditional Cantonese restaurants serving Dim Sum. The Saw Seng Kew Building at 23 Beach Street is a double-storey office building that was erected in the early 20th century. 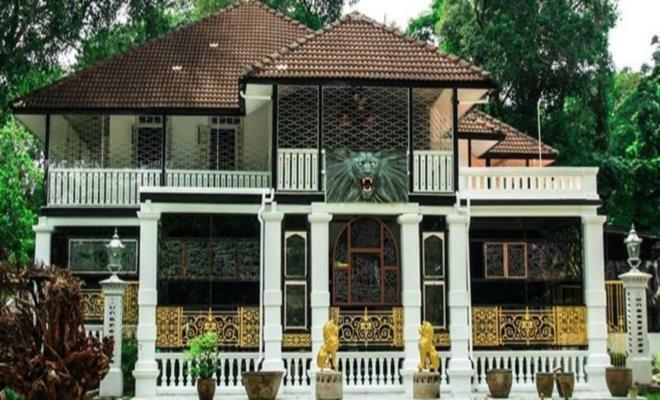 Segara Ninda or Ku Din Ku Meh House is a double story bungalow where Tengku Baharudin Tengku Meh, also known by the nickname, Tunku Kudin used it as his trading base for his trading such as birds' nest, timber and coconut. 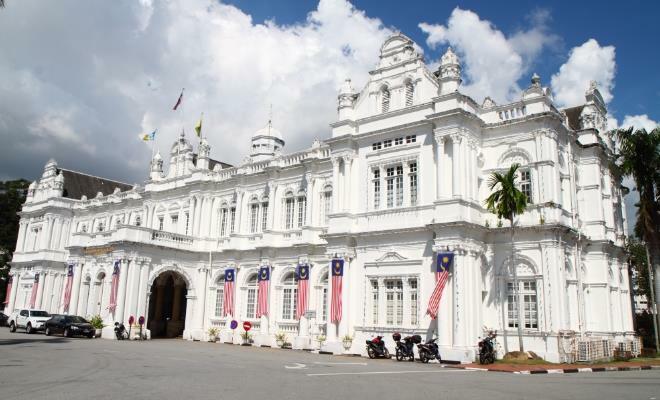 Seri Mutiara is the official residence of the Yang Di-Pertuan Negeri, or governor, of Penang and was completed in 1890. Shade me if you love me depicts an umbrella over eight cat prints. 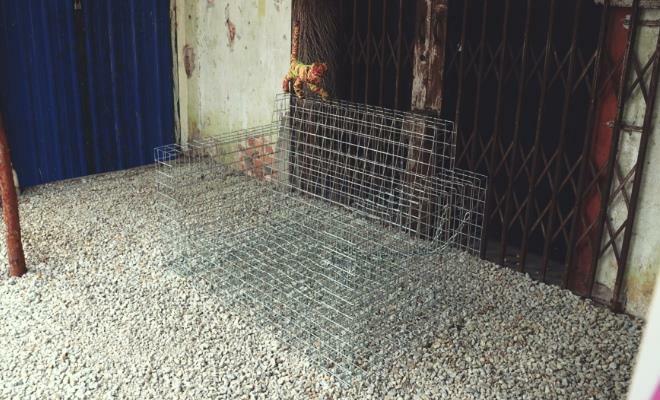 The intention is to create awareness for people to adopt and shelter stray animals, particularly cats. The Shao Lin Athletic Association of Penang was established in 1956 by Patriach Sik Koh Sum in order to teach Sao Lim Hood Khar Pai. Sheikh Al-Hadi's Residence is a bungalow owned by Muslim novelist and journalist, Syed Sheikh bin Syed Ahmad Al-Hadi. He moved to Penang to enhance his background in literature and journalism as well as to advance in the field of Islamic study. 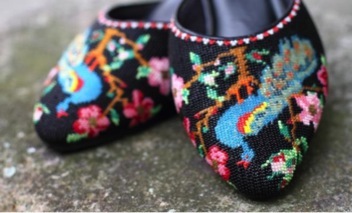 Tan Kok Oo custom-makes Nyonya beaded shoes and slippers which are traditionally worn with the Nyonya kebaya and sarong. His clients can choose their motifs from his catalogues or bring in their own print outs for him to refer to. Creating a pair of beaded shoes is an incredibly time-consuming process as the plastic beads are so tiny. It can take up to three months to complete the beading for a single pair of shoes. Barbers used to operate here. Shorn hair was simply swept into the Prangin canal. 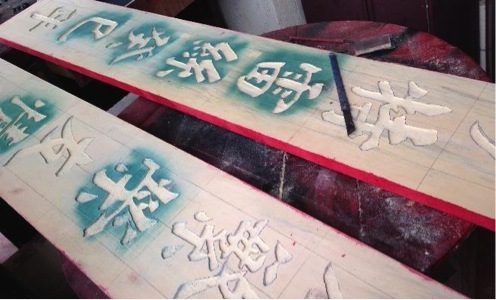 Many traditional Chinese businesses and homes in George Town still proudly display wooden signboards over their front doors - the former announce company names or auspicious couplets, while the latter depicts family surnames. 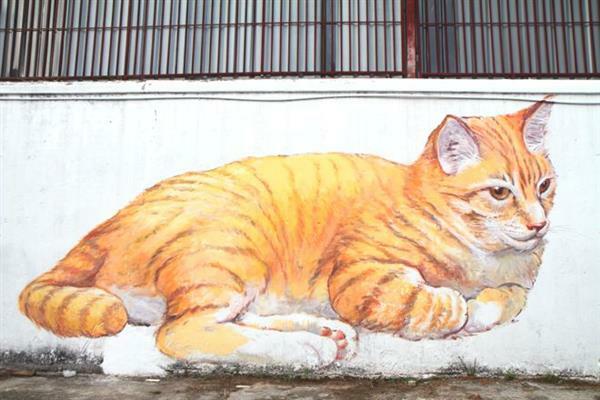 "Skippy" or a giant cat mural bless the walls of George Town in conjunction with George Town Festival 2013. 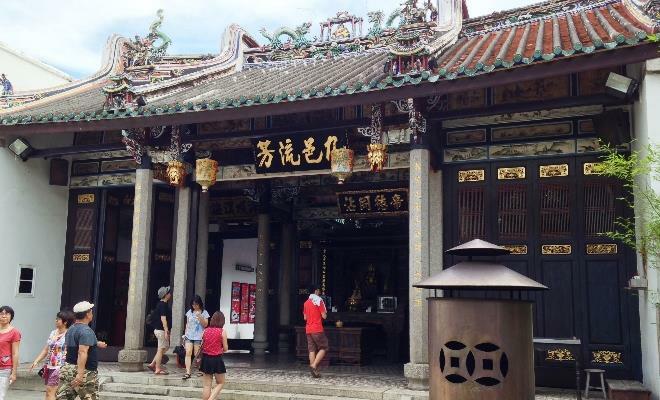 Snake Temple was built in 1850, dedicated to Chor Soo Kong, a Buddhist priest and healer. 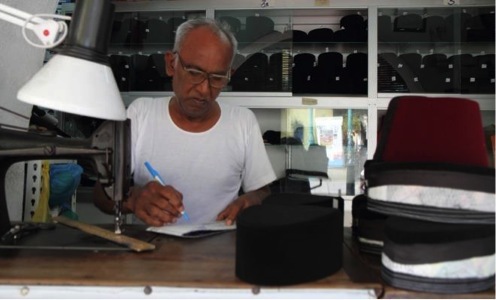 A songkok is traditional Malay headgear worn by men during important religious and festive occasions such as Hari Raya, weddings and the weekly visit to the mosque. Soo Beng Dispensary is a heritage building built in the Art Deco style with Shanghai plaster which was established by Dr Lim Chwee Leong. The Soon Tuck Wooi Kwon was established in 1838 for people from Soon Tuck, Kwangdong. George Town's spice merchants which operate from shops along Lebuh Pasar in the Little India enclave are an enduring legacy of Penang's spice trade. 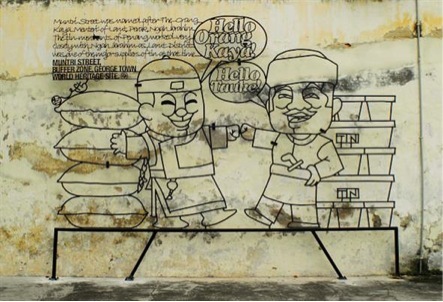 These traders play an integral part in Penang's food industry and culinary heritage. 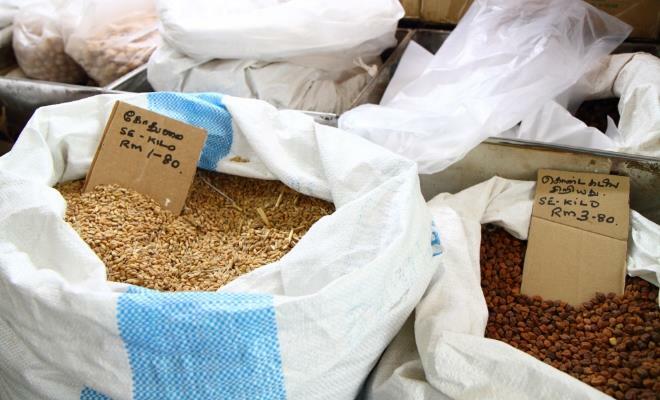 The shops are packed to the brim with spices from all over the world, which are then distributed to wholesalers, small grocery stores, restaurants, grinding mills and housewives. 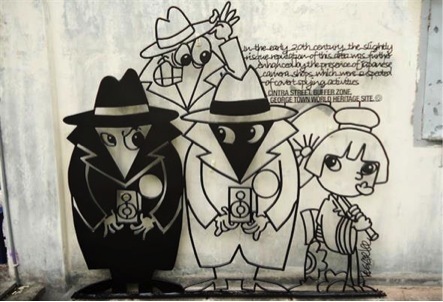 In the early 20th century the slightly trisque reputation of this area was further enhance by the presence of Japanese camera shops which were suspected of covert spying activities. 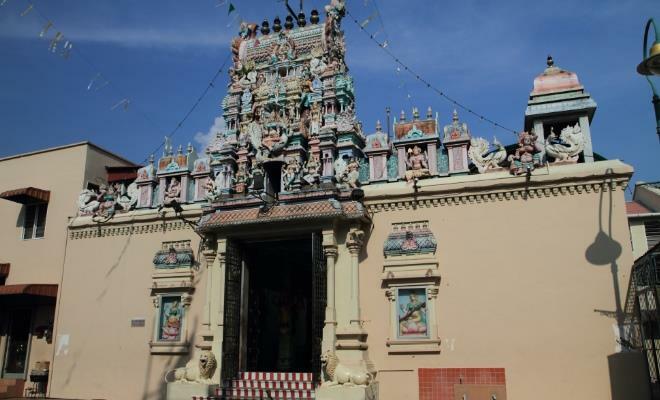 Built in 1833, the Arulmigu Sri Maha Mariamman Temple is the oldest Hindu temple in Penang, Malaysia, and features sculptures of gods and goddesses over its main entrance and facade. The Sri Teratai is the official residence of the Chief Minister of Penang. St.Francis Xavier Church was built for the Tamil-speaking Catholics in Penang. The church was founded in 1852 by Father Francis Xavier Hob. 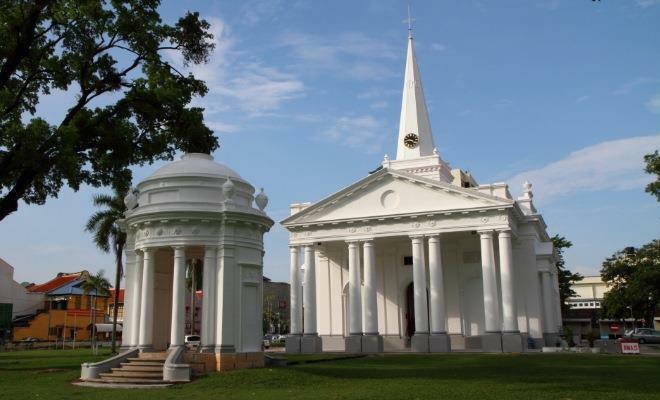 The St George's church is one of the oldest landmarks in Malaysia and it's the oldest Anglican Church in South East Asia, built in 1818. It was restored as a National Treasure in 2010-2011. Today, it is still a place of worship for the Anglican Christian communities. Standard Chartered Bank Building is the first bank in Malaysia, which is built in a stout four-storey structure in British Palladian style. 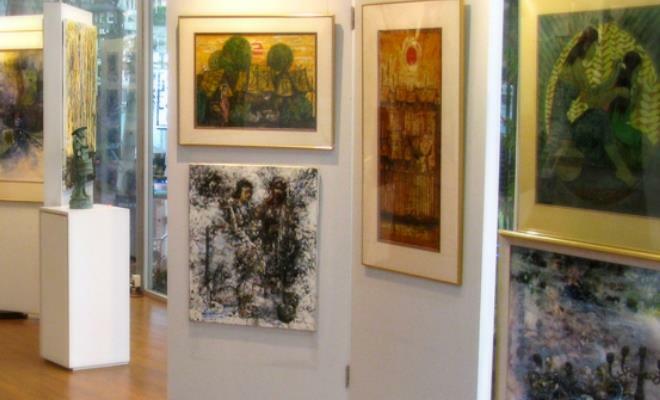 The Penang State Art Gallery is a comprehensive collection devoted to modern and contemporary art. 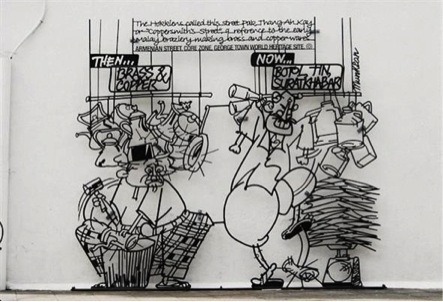 The non-circulating collection documents painting, sculpture, drawings, prints, photography, architecture, design, performance, video, film, and emerging art forms from year 1965 to the present. 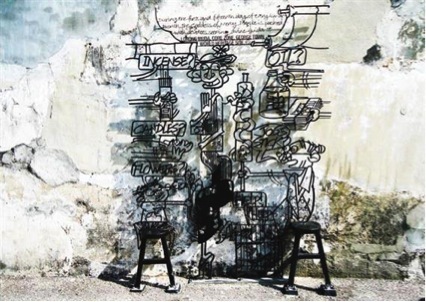 The Penang State Art Gallery presents artworks revolving around ideas of identity, urbanization, globalisation and the environment, these works raise pertinent issues on urban living in the modern cityscape and prompt us to consider how the artists have translated their visions about these issues into works of art. The State Assembly Building is a public building built in the Anglo-Indian classical style in the early 19th Century. The centre showcases a variety of high quality craft which can be purchased. These include hand woven scarfs, tie and dye bags in vibrant colours, home made soaps, candles etc. All products are made by members with special needs who have channeled their skills and abilities into a viable career. Stepping stone is a Support Centre for Community Living run by an NGO, Asia Community Service. Butterworth railway station is located in the transportation hub which offer various transportation such as bus, taxi stations, ferry and train. Architecture of this station maintains the cultural heritage inherited from British colonial era. 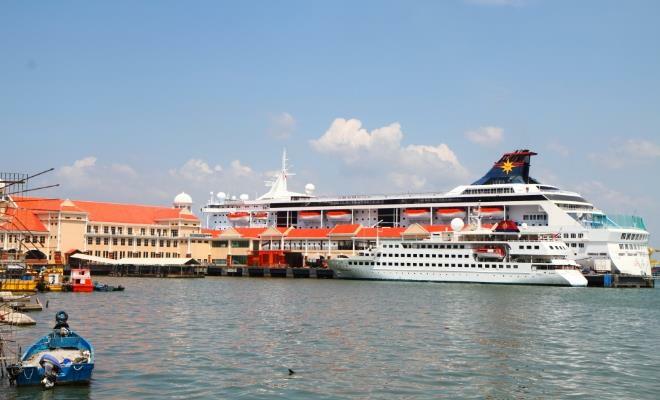 This station provide passage to other port of Peninsular Malaysia and southern Thailand such as Bangkok and Hat Yai. 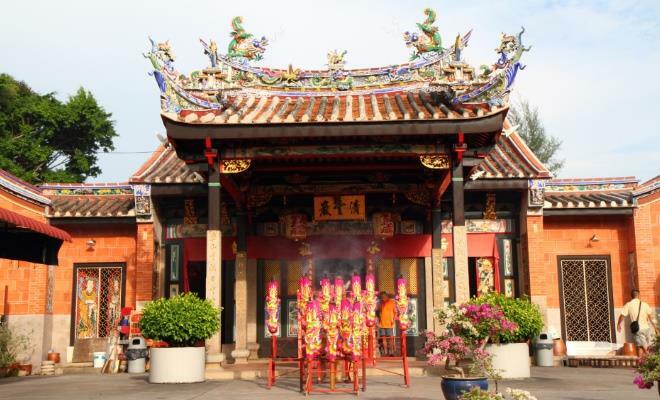 Stroll along Jalan Masjid Kapitan Keling to experience the Street of Harmony that consists of four places of worships that coexist together in harmony. 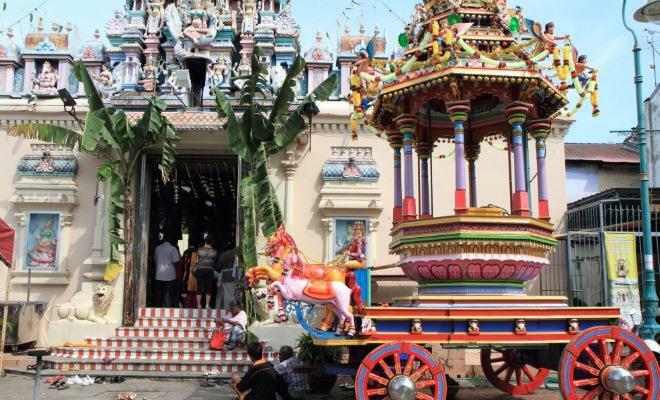 Along the street, you will find St George's Church, Sri Mahamariamman Temple, The Goddess of Mercy Temple and Masjid Kapitan Keling. Suffolk Estate Bridge is located in front of Suffolk House and is a reconstruction of an 18th century bridge across the Ayer Itam River. Suffolk House was originally owned by Captain Francis Light. Today Suffolk House has been converted into well-established restaurant. 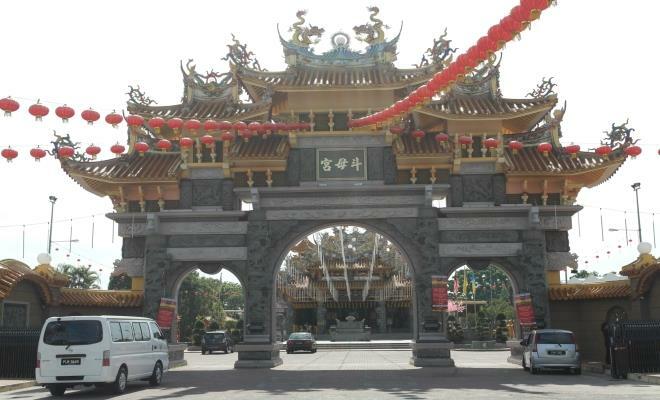 Sun Wui Wui Koon, located at Lebuh Bishop has strong Chinese influences in its building style. 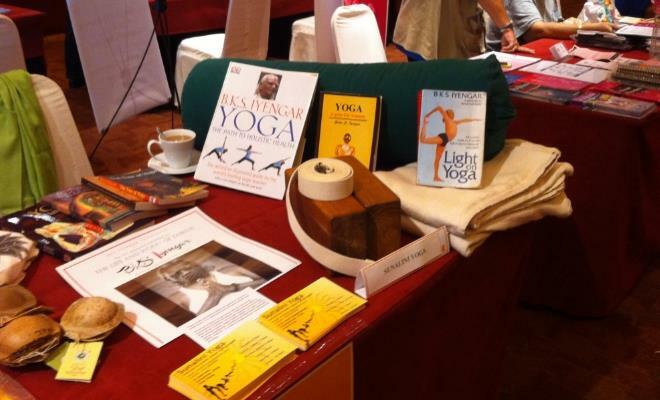 Sunalini Yoga is a yoga centre located in George Town. 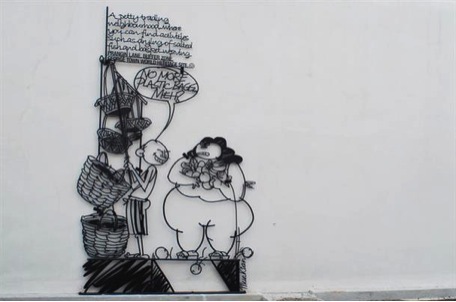 Address: 92 Love Lane, George Town, 10500, Penang, MALAYSIA. 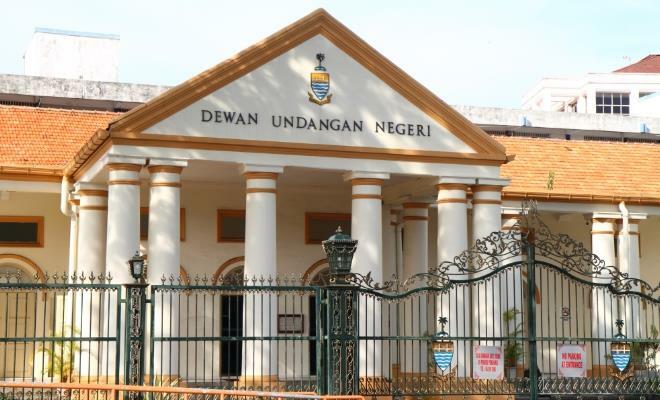 The Penang Supreme Court Building, or Mahkamah Tinggi Pulau Pinang, is an elegant Palladian-style building along Lebuh Light in George Town. The courthouse was built to replace the original courthouse which was constructed on the same site in 1809. 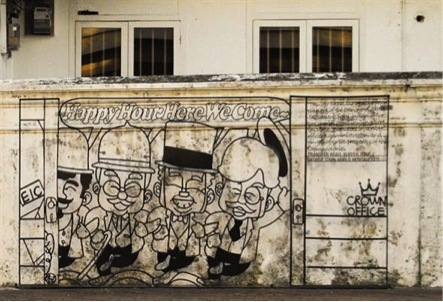 The Swee Hock Chan Godown belonged to supporters of Dr Sun Yat Sen which was previously used to accommodate the Penang Philomatic Union. The Swettenham Pier is the seaport established in 1903. It was named after Frank Athelstane Swettenham, the first Resident General of the Federated Malay States. 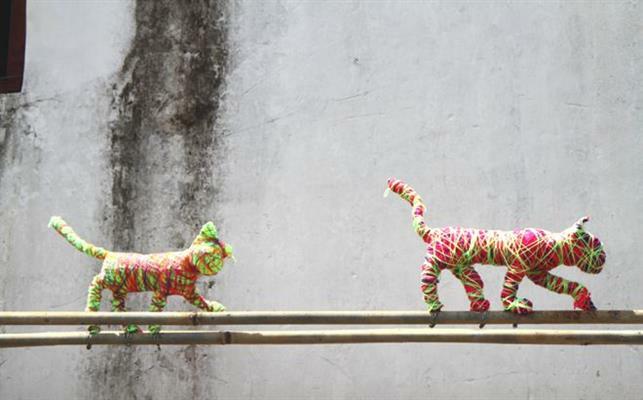 This art installation is intended to create awareness among pet owners, to spend time with their pets. Established in 1998, Talentime Music offers practical and theory music courses for both children and adults. Their list of music courses include piano, organ, violin, guitar, er hu and vocal classes. Eng Chuan Tong is the clan temple of the Eng Chuan Tong Tan Kongsi which is the oldest of the Tan clan associations in Penang. 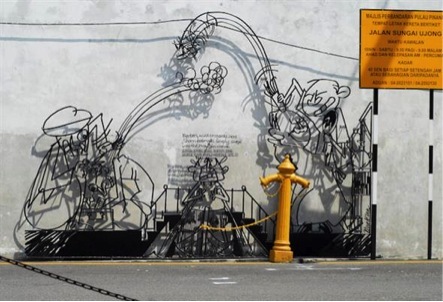 It is located at Seh Tan Court which is linked to Beach Street in the inner city of George Town. Tanjung City Marina, also known as the Church Street Pier is open to the public and is a favorite hangout place for Penangites. 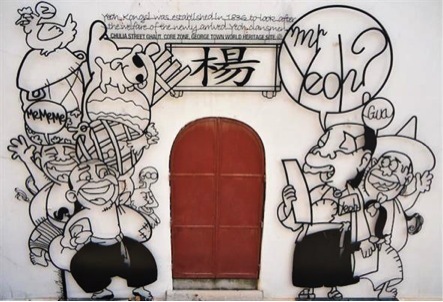 Ghee Hiang began as a humble pastry shop in Penang more than 150 years ago. 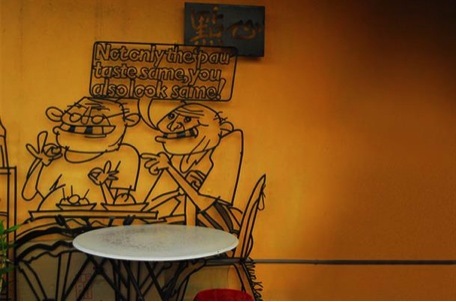 Tourists flock to this Penang flagship store to buy its famous Tau Sar Piah freshly baked from the oven. The Teh Bunga Mansion at 138 Hutton Lane is a stately double-storey historic building in George Town. 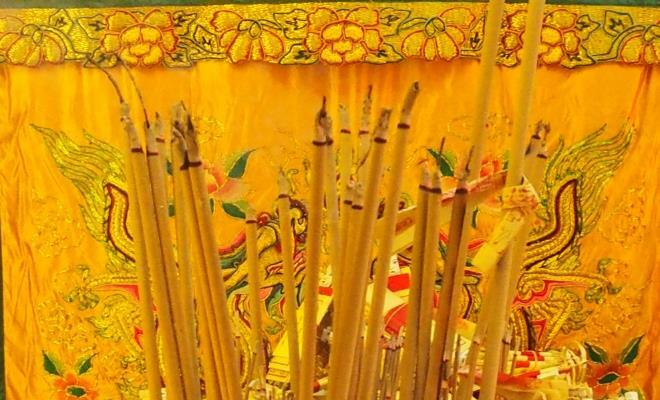 During the first and fifteenth day of every lunar month the goddess of Mercy Temple is a packed with devotees seekin divine guidance. The Nine Emperor Temple will be decorated every 9th month of Chinese Lunar Calendar for the annual Nine Emperor Gods festival. The temple was constructed in 2000 to replace an older temple that was built next to it in 1971. 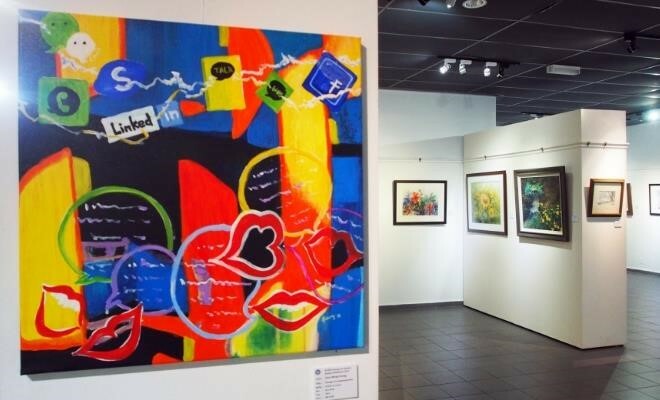 The Art E Space is all about providing an accessible artistic experience for individuals of all ages and abilities. 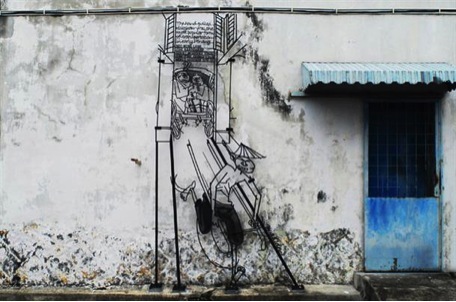 Following her first mural of a 'Little Boy' on Prangin Canal, George Town, 'The Boatman' is the second mural painted by Russian artist Julia Volchkova during her brief trip in Penang. Opened in August 2013, The Camera Museum exhibits a collection of cameras from the eighteenth century till present day, from antique to lomo cameras. Keep a look out for unique rooms such as the Pinhole Room that allows you to imagine yourself being inside a large camera and understand how a camera works from the ancient time until today. 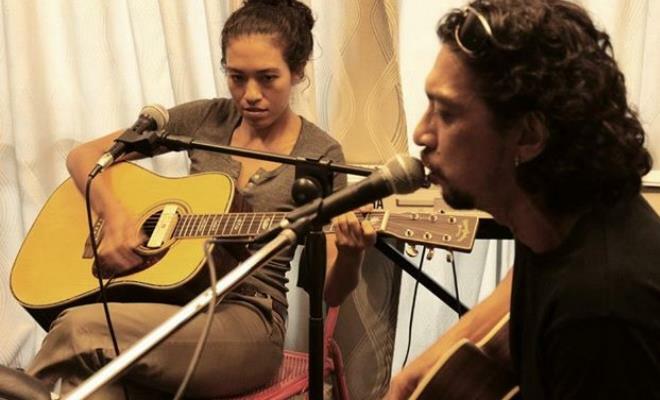 The Cat Studio is a music, dance and performance school with a featured recording studio. Apart from offering music and dance courses, The Cat Studio also offers audio recording, editing and voice overs. There's also an online music store to check out on their website. The Garage is a restored building at Upper Penang Road. The Garage began as a garage and motorcar showroom for British Leyland vehicles including the Morris, Austin and the Jaguar. For many years, it functioned as a car service centre. The Great Wall is the name of the hill retreat which is built in 20th century Penang tycoon and Municipal Commissioner , Khoo Sian Ewe. It was built in 1933 in the Art Deco Style. 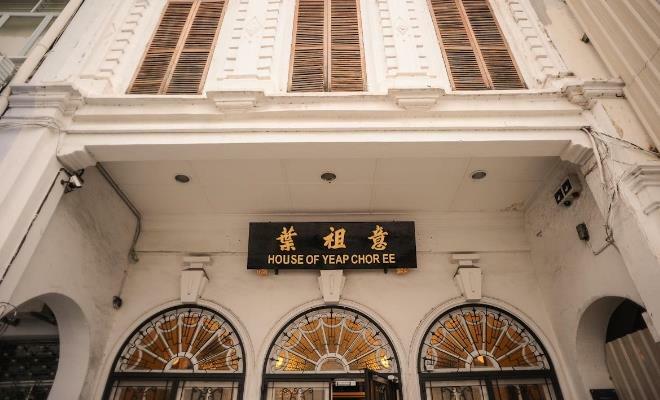 The House of Yeap Chor Ee was the first home of Yeap Chor Ee, a young immigrant who came to Penang in 1885 and worked as a barber before becoming a captain of industry at the turn of the 20th century. The building was converted into a social history gallery in 2008. 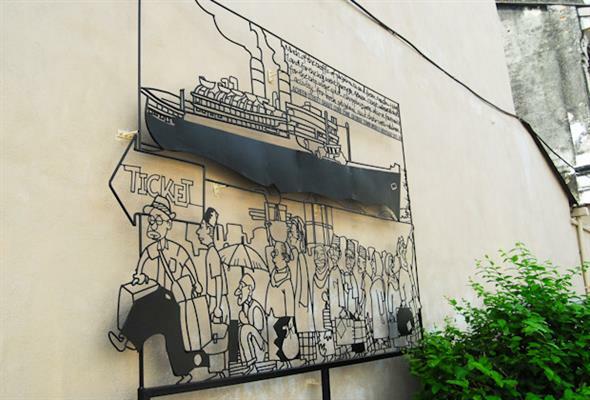 Through the journey of Yeap Chor Ee, the gallery gives an insight into his remarkable life and the lives of immigrants who arrived on the island from China more than 100 years ago. 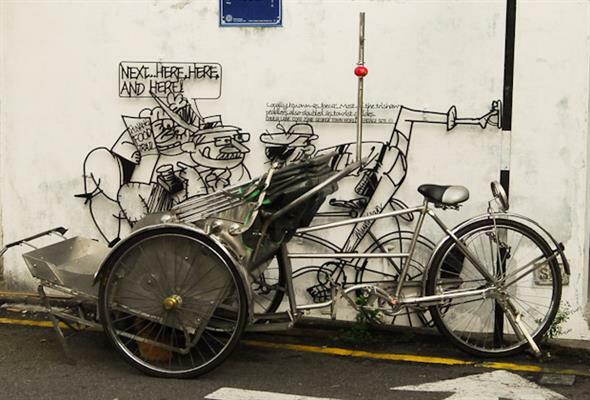 Located in Lebuh Penang, The Leaf Bicycle Rental offers rentals for classical bicycles, folding bikes, mountain bikes, parent-child bikes and tandem bicycle. Chulia Street was one of the main streets laid out by Captain Francis Light. Today is known as "Backpackers" main street. 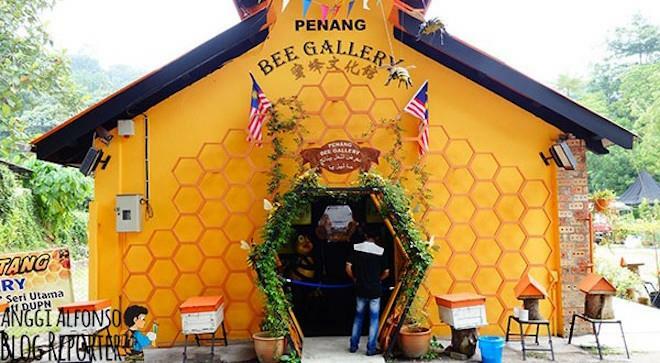 A Malaysia Book of Records award winner - The Owl Museum on Penang Hill offers a fascinating collection of over 3,000 rare and exotic, owl-inspired arts and crafts. Be inspired by the enigmatic birds of prey and the magic they have sparked in human cultured and imaginations since thebeginning of time. 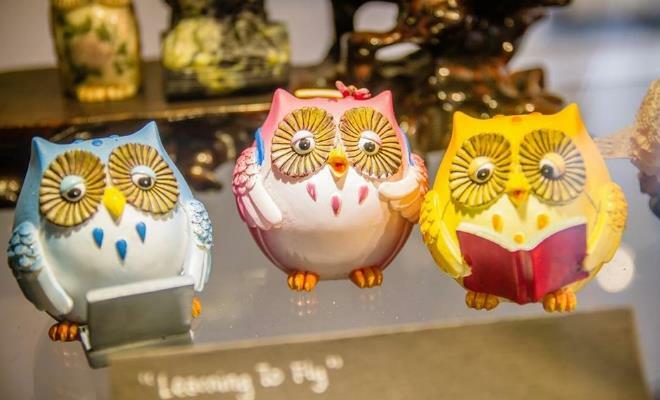 The museum sets to mesmerize with owl crafts sourced internationally from 30 countries all around the world. Expect to be enthralled during your visit as the museum re-introduce and pay tribute to these mystical creatures in different forms, shapes, colours and sizes. Withthe new addition in year 2014, the 3D interactive owl sculptures will get you and your camera busy for plenty of photo opportunities. The Whiteways Arcade building was constructed in the early 1900's. The block got its name from its original occupant, the Whiteways & Laidlaw General Store at the Bishop Street end of the building, while the Netherlands-Indian Bank occupied the Church Street end of the building. During the British administration, Whiteways Building housed upmarket shops and offices. The Hokkiens called this street Par Thang Ah Kay or Coopersmiths Street, a reference to the early Malay orazlery making brass and copper wares. Thin Seng Sauce Factory is a traditional soya sauce factory which is located at George Town. Thio Thiaw Siat Building is located along Beach Street in George Town with an impressive structure. 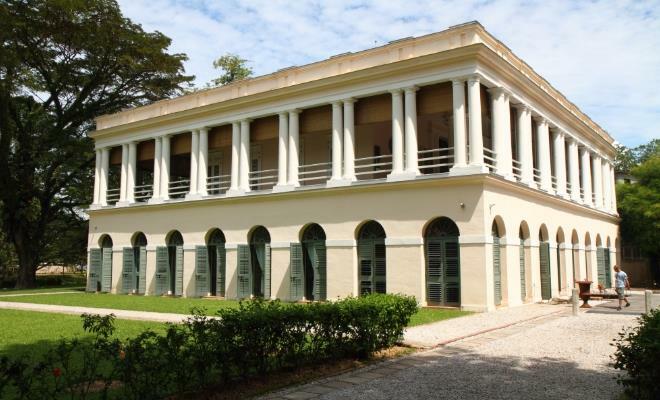 It was built in 1920 for the estate of the late Cheong Fatt Tze. The buildings have a combination of Eastern & Western elements reflective of the Starits Eclectic Sense of aesthetics. 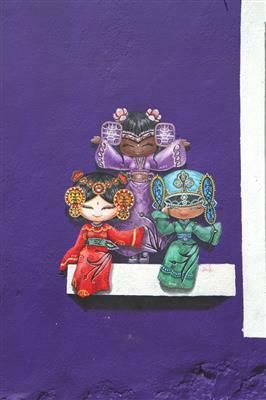 This mural caricature depicts three different girls in traditional costumes. Kimberely Street is famous for its hawker food. Some stalls have been here for over 3 generations. For over four decades, master craftsman Ng Chai Tiam has carved countless traditional Chinese stone seals which are used by businessmen, traders and caligraphy artists as a signature on official documents and works of art. Seck Chuan Lane was a distribution centre for market produce. Many itinerant hawkers took advantage of the crowds by plying their foods here. One of the favourite foods sold is ting ting thong or rock candy, a hardened mixture of sugar, sesame seeds, and nuts loved by kids. It has to be 'Chiselled' and 'Hammered' to break it into smaller biteable pieces. 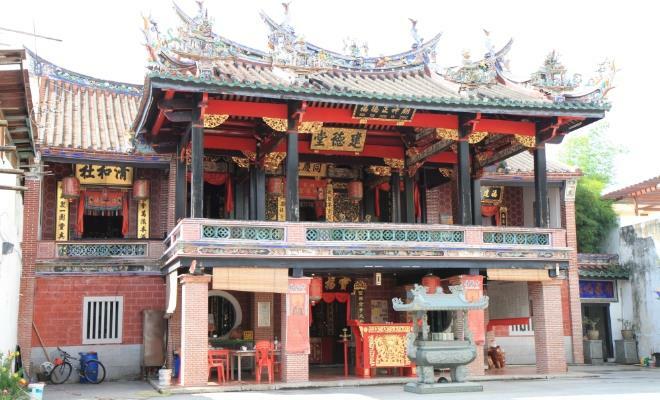 Toishan Ningyang Wui Kwon (36 & 38 King Street) is a clan temple to the Toi Shan community in Penang, who originated from a Canton locality. The temple has a membership of close to 5,000 people and is around 200 years old. One big, one small! 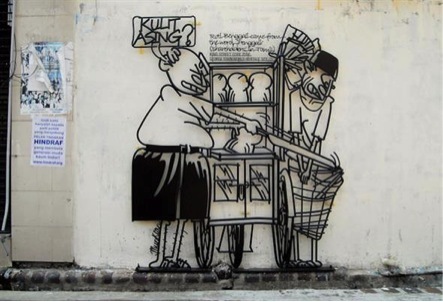 Tok tok mee is so called because hawkers would strike a ‘Tok Tok’ sound to signal their presence. Ayoyo, too spicy? Water! The famous Weld Quay was the birthplace of Kelinga Mee, a spicy Indian noodle dish created to whet the appetites of sailors and port workers. 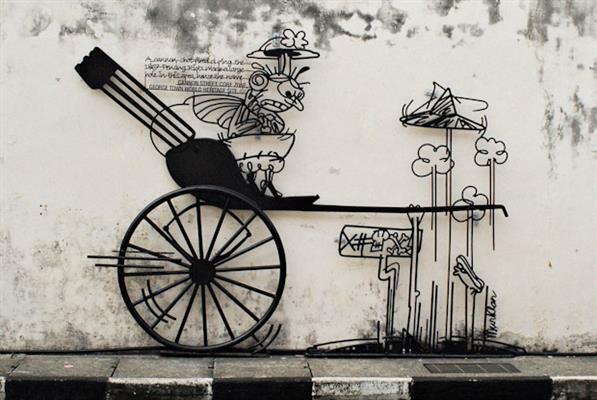 The hand-pulled rickshaw was the most popular form of transportation in early Penang. 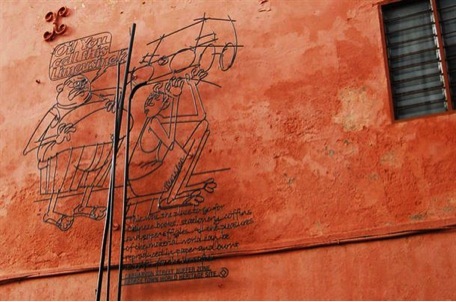 The Tamils refer to this street as upperlearan Teru on Salt Traders Street, a reference to the trading activities. The foundation stone of the Town Hall was laid in 1879 and the main building completed in 1883. It consisted of an assembly hall, a grand ballroom, and a library. An annex was added in 1890 while the porch and top floor added in 1903. The left wing - when cement plaster was introduced - as added in 1930. Part of the unique feature of Townbikes is the four-seater bicycles that comes in striking shades of yellow and red. Make sure to reserve these bicycles quick before someone else get their hands on it. 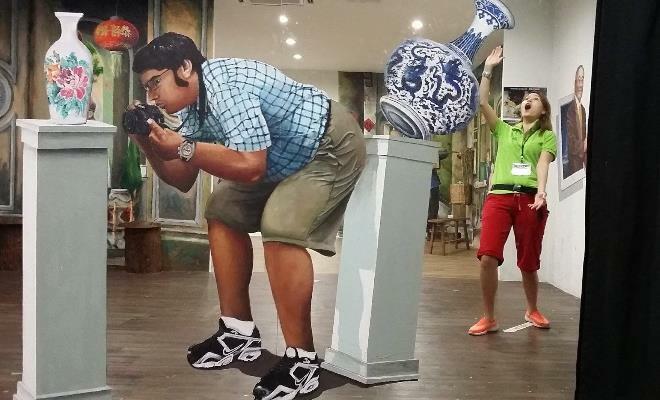 Located in Teluk Bahang, the Toy Museum Heritage Garden is a wax museum, toy museum, museum of bags and collectibles and heritage garden rolled into one. 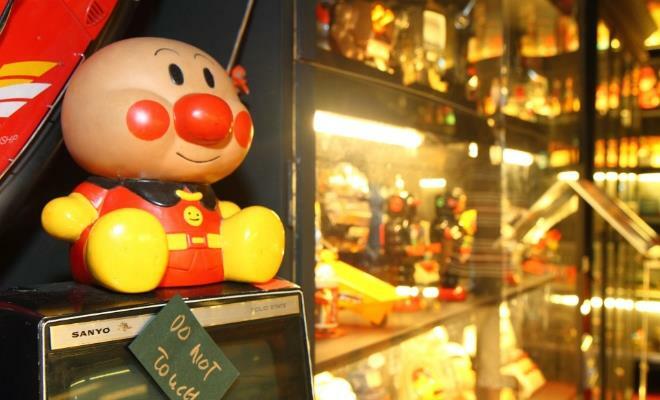 The museum has been listed twice in the Malaysia Book of Records as one of the largest toy museum in the country. The tour begins from George Town World Heritage Incorporated (GTWHI) with a brief introduction of the fascinating traders. 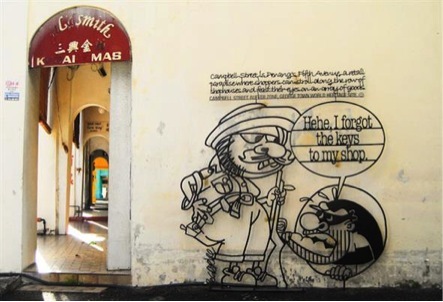 The walkabout includes sites like Campbell Street Market, Jalan Masjid Kapitan Keling, Queen Street, Market Street, Beach Street and Armenian Street. 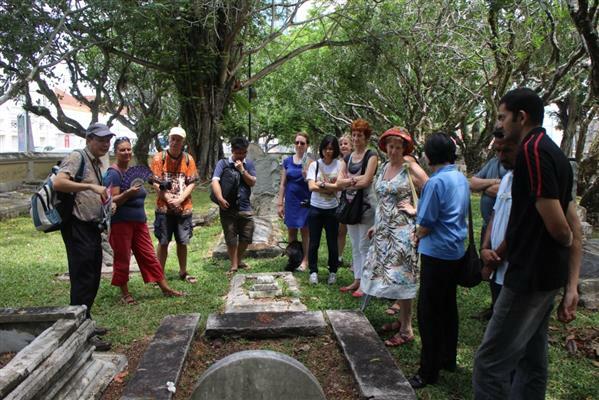 The heritage discovery walk is based on first come first served basis with prior registration. A minimum of 10 participants to a maximum of 20 participants is required for each tour. 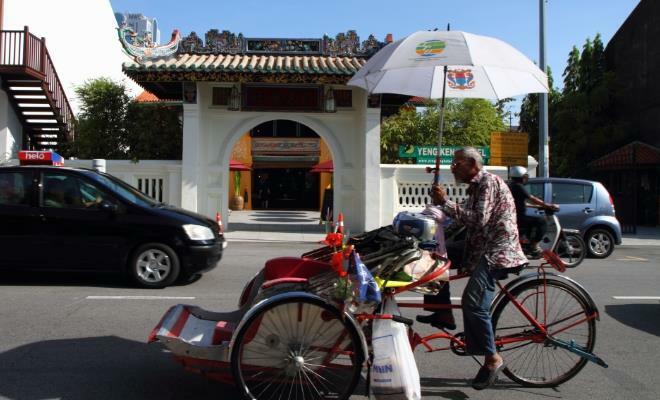 Trishaws used to be a popular mode of transport in the olden days in Penang. 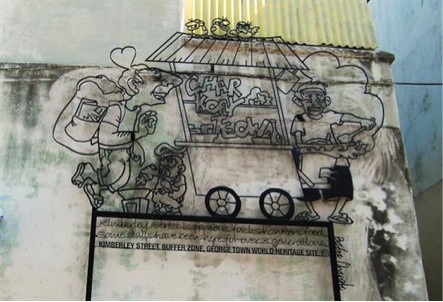 The location for this trishaw mural resembles the trishaw riders' waiting area near the Cititel Hotel. Also known as Lang Chia Keng, this building is one of the few community houses that is still standing in George Town. It is located at Burmah Road and it is only a short distance from Ariffin Court. Tseng Lung Fui Kon Soceity is located at 22 King Street which is next to Kar Yin Association. 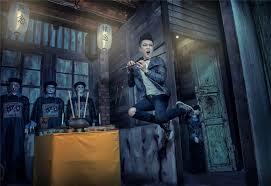 It is a district association of the Hakka people from the Tseng Lung district of Guangdong Province in Southern China. 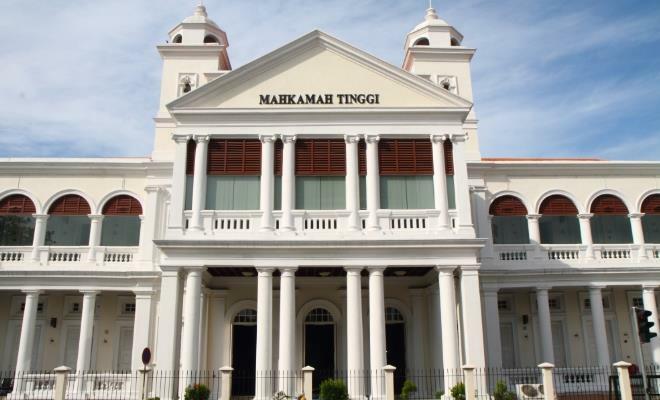 Tuanku Fauziah Museum & Art Gallery is an art gallery located in Universiti Sains Malaysia. Permatang Benuan Blacksmiths is one of the oldest cultural steel equipment manufacturer that active in business since 1841. They are the only manufacturers traditional Malay weapons, famous not only in Penang but throughout northern Peninsular Malaysia. Based on records, Sultan of Kedah placed these blacksmiths specifically to prepare weapons for his armed forces to strike against British. During those days, Seberang Perai was a province under Kedah's rule. These blacksmiths of Pekan Darat manufactured weaponry for Kedah's armforces such as cannonballs and steel weaponry during Siam - Kedah War from 1821 - 1842. Parrot astrologers were Indian fortune tellers, who used green parakeets to foretell a person’s future. Experience the FIRST of its kind in the world; challenge your visual and balancing by turning your ordered life topsy-turvy with the interior and exterior! Officially known as a Museum & Gallery of Tuanku Fauziah, located on the expansive campus of University Science Malaysia(USM). This museum has a collection of traditional Malaysian musical instruments, manuscripts, aboriginal as well as Baba and Nyonya pieces. 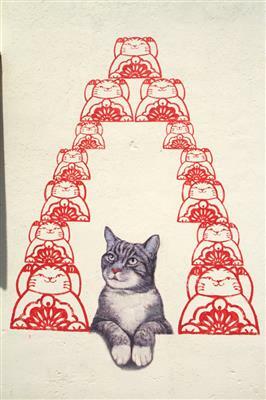 War Emperor's Temple or Wu Ti Meow is a clan temple at 36 King Street in George Town, Penang. It belongs to the Toi San Association based next door, at 38 King Street. The temple venerates Kwan Kung, literally Lord Kwan. This is the Wade-Giles spelling which in Pinyin is Guan Gong. Kwan Kung is regarded as the god of war. It is the deity often portrayed with a red face and holding a guandao, a huge crescent blade. Wat Chaiya Mangkalaram or The Reclining Buddha Temple is a Thai Buddhist Temple and most notable for its reclining statue. 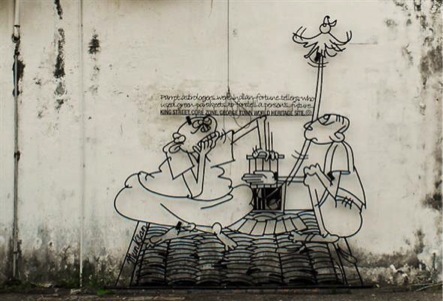 It is located at Burma Road and it can be seen on the road from Batu Feringghi. 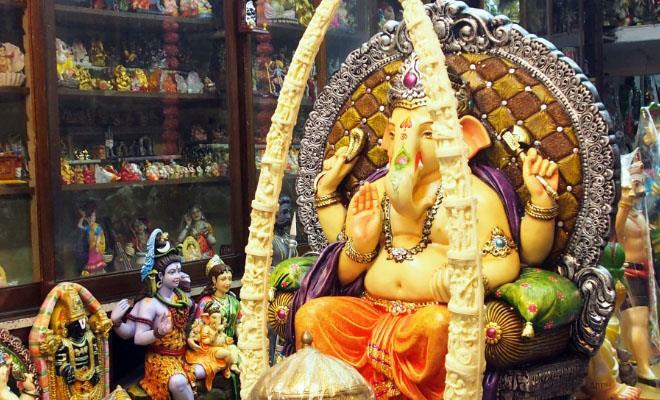 It is located right across the Dharmikarama Buddhist Temple. 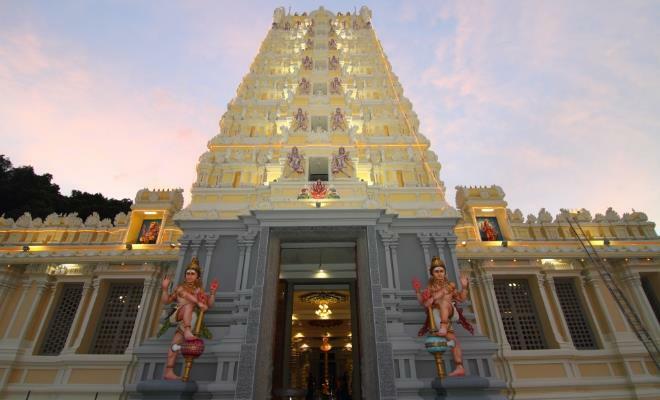 The temple is one of the oldest Hindu temples in Penang and originally located within the grounds of the Penang Botanic Gardens. Oi! You tackle my wife ah?! Ah Ling I love you Prangin River was a bustling waterway for all manner of goods that were shipped to Penang from all over the world. White Shark Swim School provides effective swimming lesson on the Penang island for beginners. With White Shark, students can learn to master various swimming styles within a session of 10 hours or two weeks. Hello Orang Kaya! Hello Tauke! 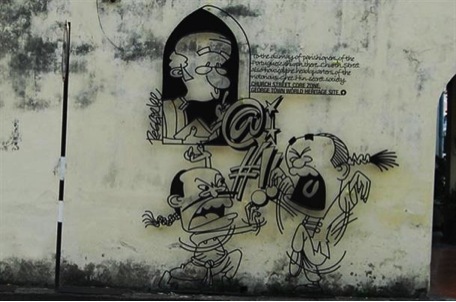 Muntri Street was named after The ‘Orang Kaya Menteri’ of Larut, Perak, Ngah Ibrahim. The tin merchants of Penang worked very closely with Ngah Ibrahim as Larut District was one of the major suppliers of tin at the time. 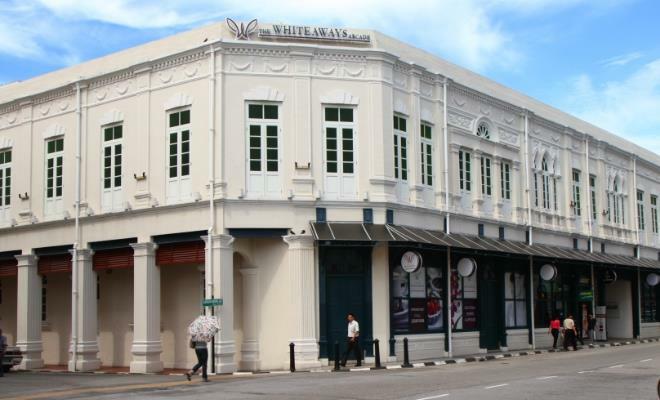 Wisma Yeap Chor Ee is an elegant historic building which is located right across China Street Ghaut from Wisma kastam and is on the same side as UAB building and the Regional Office of Wawasan Open University. 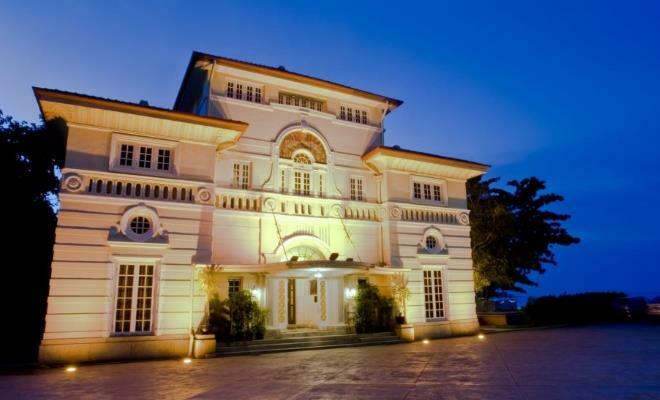 With an elegant mansion along the Northam Road in George Town, Penang Woodville was built to resemble a French chateau for the late Lim Lean Ting. It was designed by Charles Miller of the firm A.R.I.B.A in 1925. World War II Pill Boxes are miniature fortresses built by the British before the World War II began. The purpose is to monitor and check the advancement of the Japanese troops. The betel nut or ‘ Pinang’ tree gave the island its name. Aiyoh, Think I climb up the wrong tree! Also called toddy or palm wine, tuak is an alcoholic beverage made from underdeveloped flower of coconut palm. The collecting and market for tuak was entirely an Indian affair with the majority of its drinkers being Indian labourers. It was built in 1800 using planks and wood and has since undergone several renovations with help from prominent donors. In the months of March and July, Chinese Opera is performed within the temple grounds. Yap Kongsi is a clan association of Hokkien Chinese in Penang. It is smaller than the other Kongsi's but the exterior design and rooftop details are very intricate. 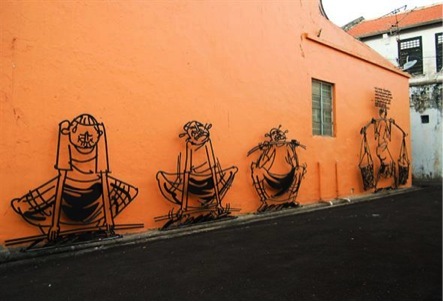 Located at Armenian Street, it is next to the Yap temple within the George Town Heritage Enclave. 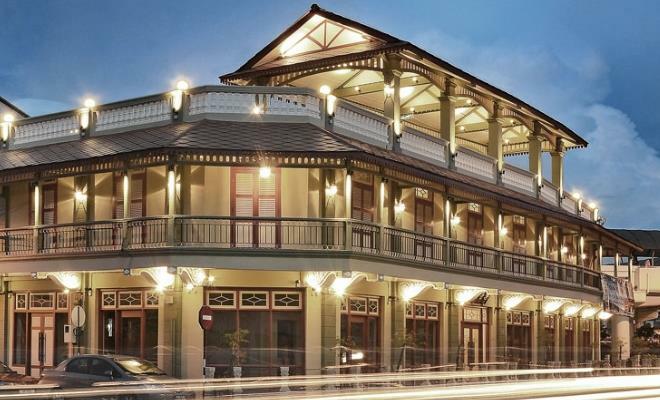 Yeng Keng Hotel is a heritage boutique hotel which is located at the core of George Town, UNESCO World Heritage Site. 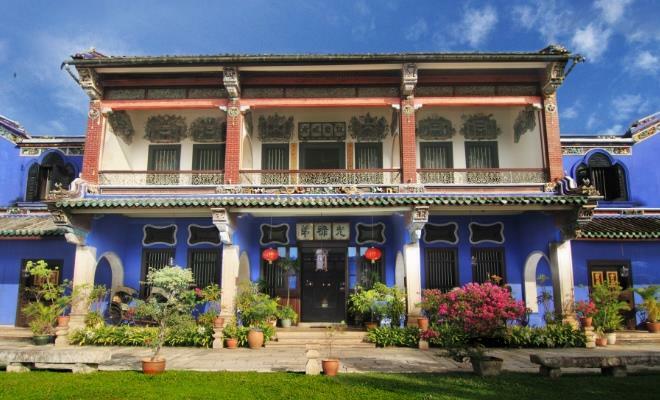 It is close to Cheong Fatt Tze Mansion, Fort Cornwallis and Penang Islamic Museum. Yeoh Kongsi or its official name, Har Yang Sit Teik Tong Yeoh Kongsi is a clan association of Hokkien Clansmen which is contains Yeoh surname. It is also known as a Yeoh Clan Association. 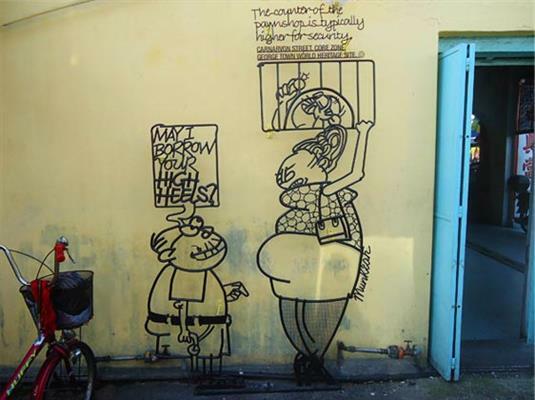 It is located at N0 3, Chulia Street, George Town. 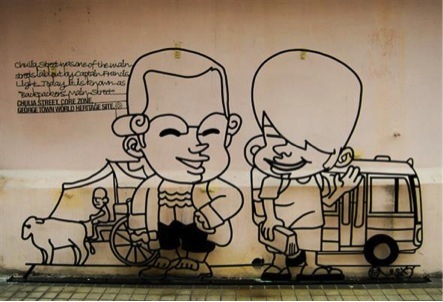 Yeoh Kongsi was established in 1836 to look after the welfare of the newly arrived Yeoh clansmen. The Yin Oi Tong is one of Southeast Asia's oldest traditional Chinese medicine halls, established in George Town in 1976. The current proprietor, Chong Yit Leong has practised TCM for over 50 years. In a matter of minutes he can diagnose patients by taking their pulse, he then prescribes the correct combination of traditional herbs - either ground into capsules or boiled as tonics. After the establishment of Penang by the British in the late 18th century, a steady flow of Chinese traders and workers came to settle on the island. The clan association, founded in 1840, represents two Hakka dialect groups from Eng Teng (Yongding) and Tai Pu (Dabu) counties, China. At the start of World War I, Zhemchug was part of the Allied (British-French-Japanese) joint task force pursuing the German East Asia Squadron under Admiral Maximilian von Spee, and operated in the Bay of Bengal together with the Imperial Japanese Navy cruiser Chikuma. On 28 October 1914, she was moored at Penang, when attacked by the German light cruiser Emden in what was later called the Battle of Penang.